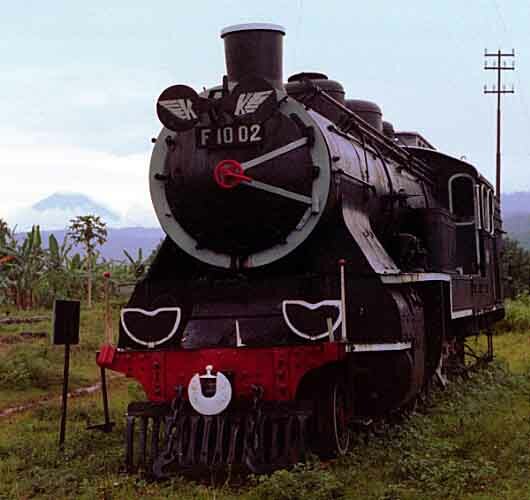 On this trip I planned to go to as many as possible of the places not previously visited, mainly in eastern Java. 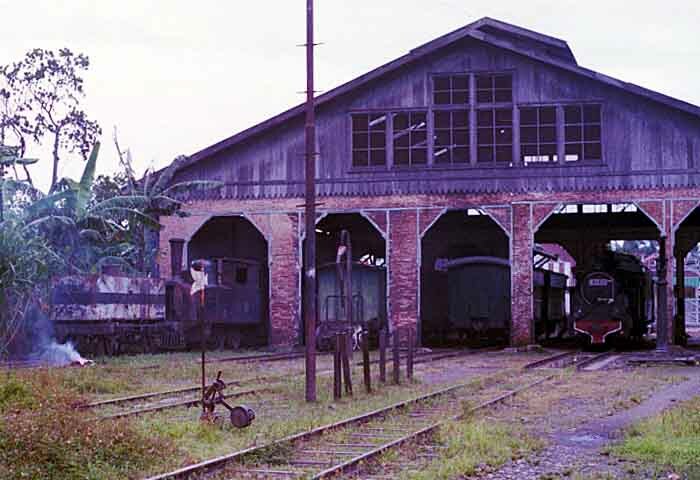 I started by visiting Bogor and Cianjur before moving to Surakarta where I found Purwosari shed, which I had previously missed. 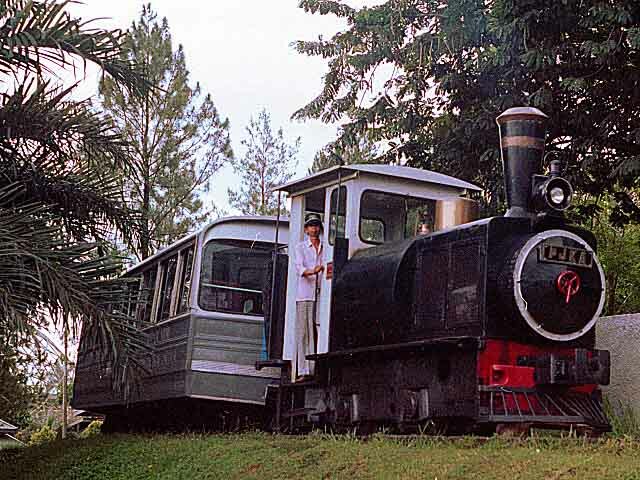 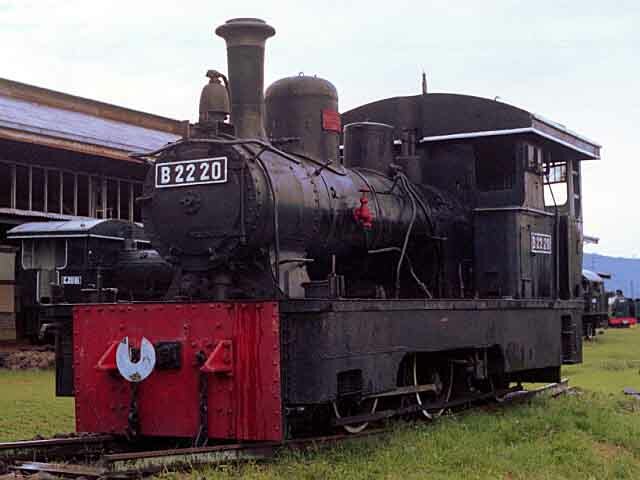 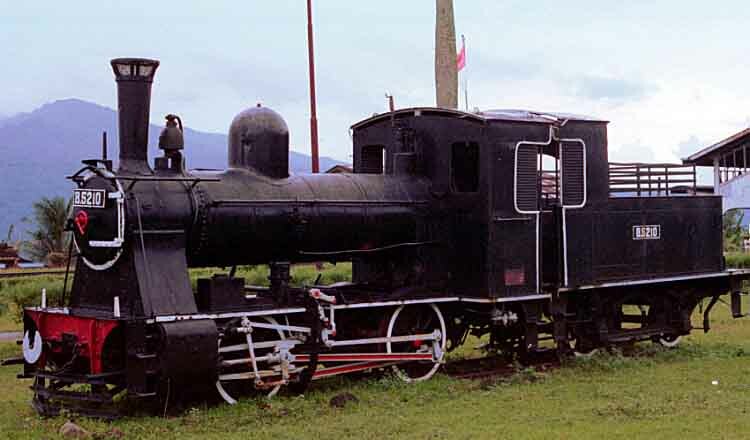 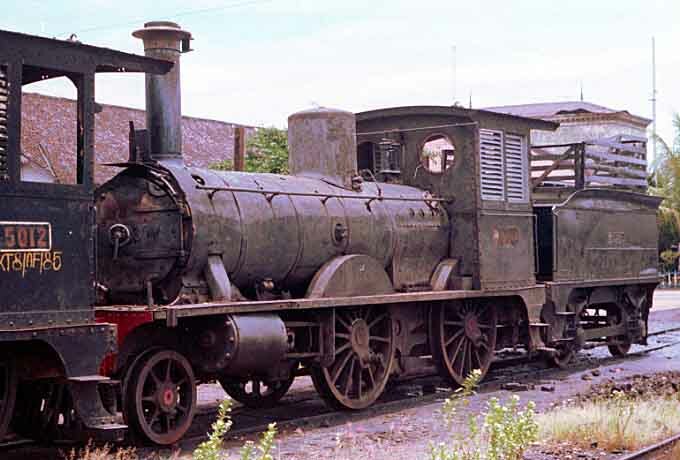 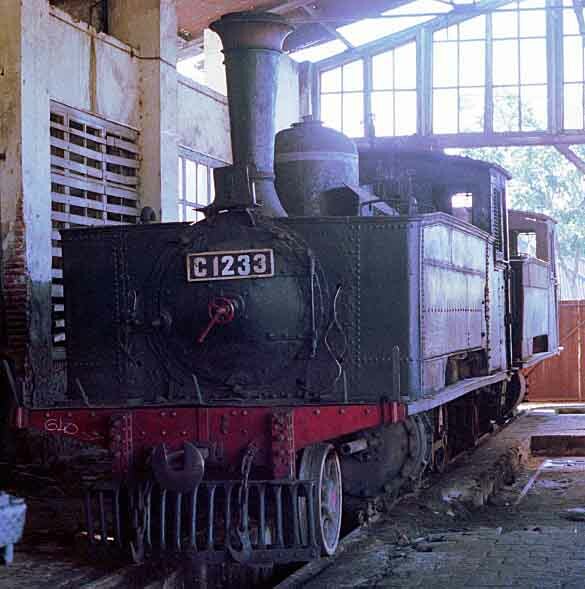 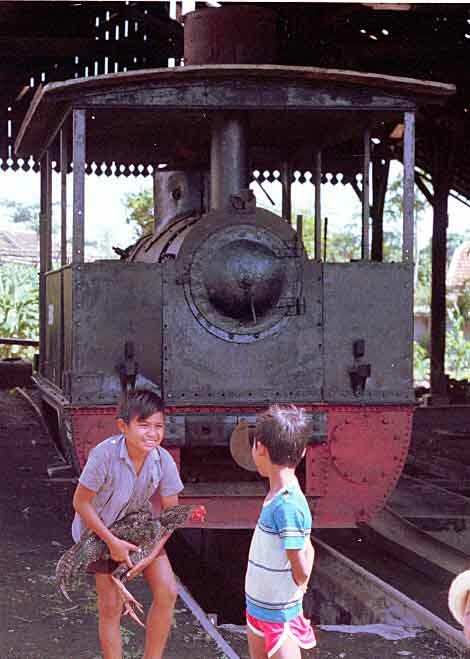 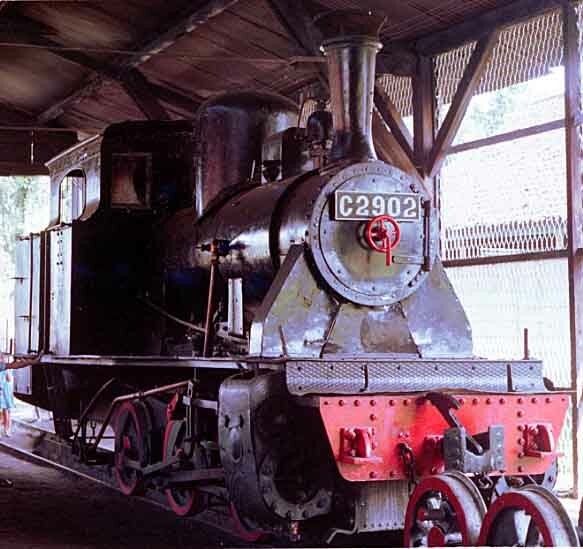 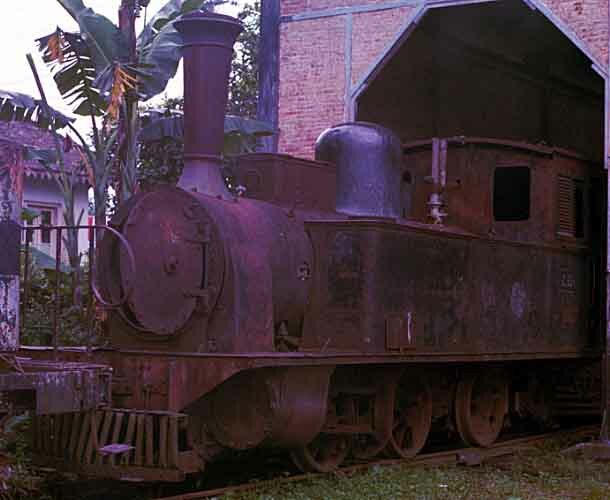 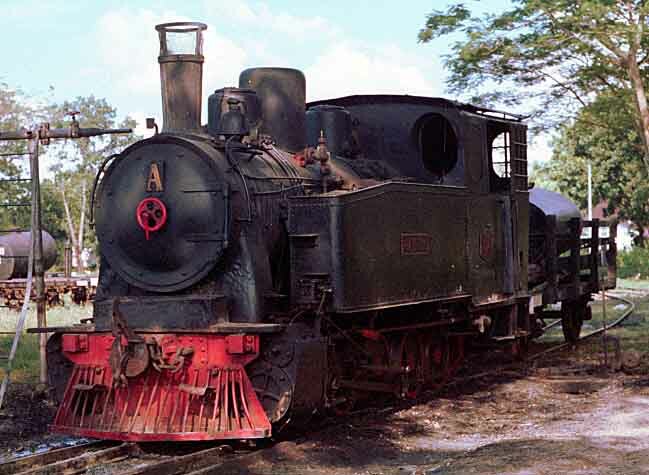 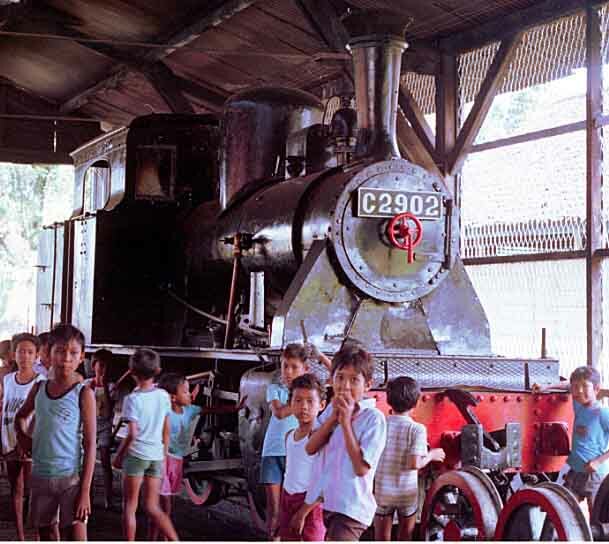 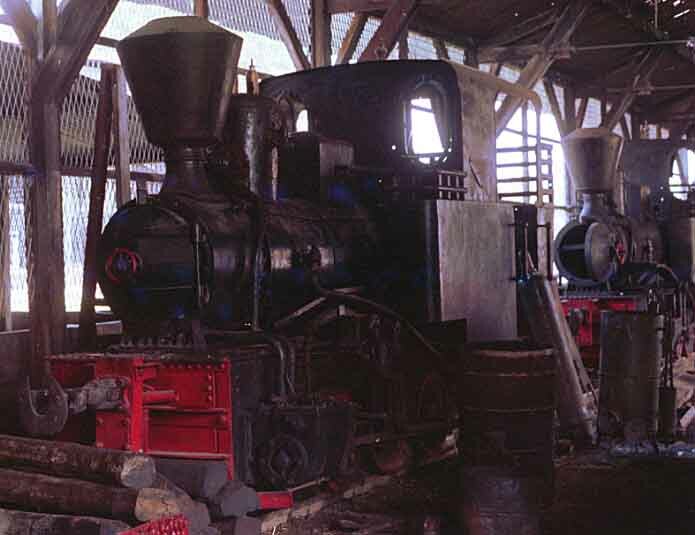 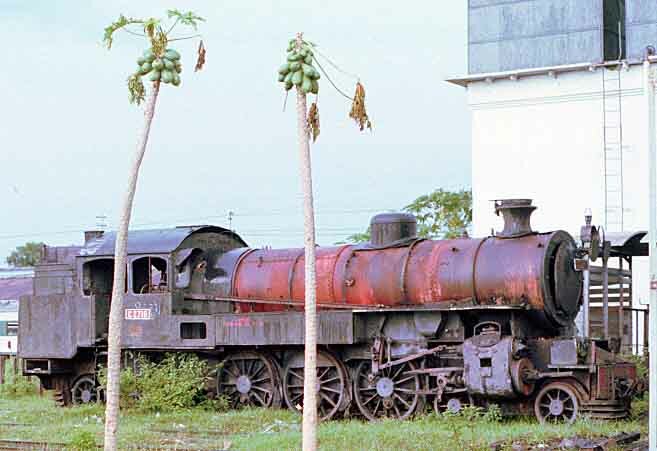 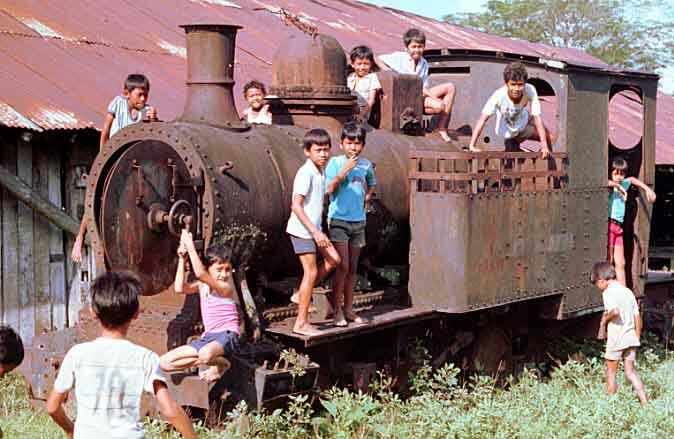 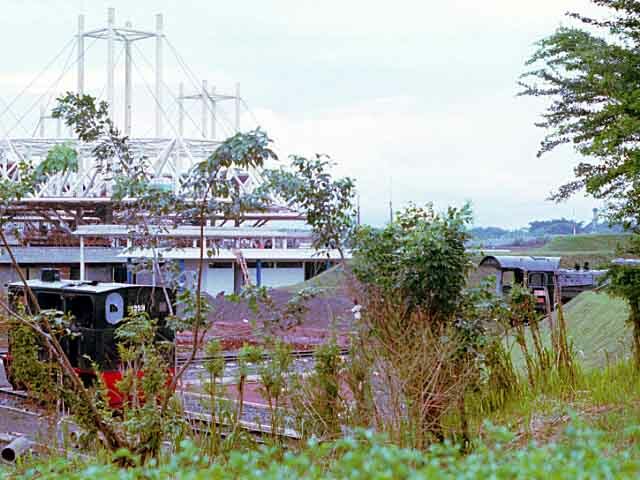 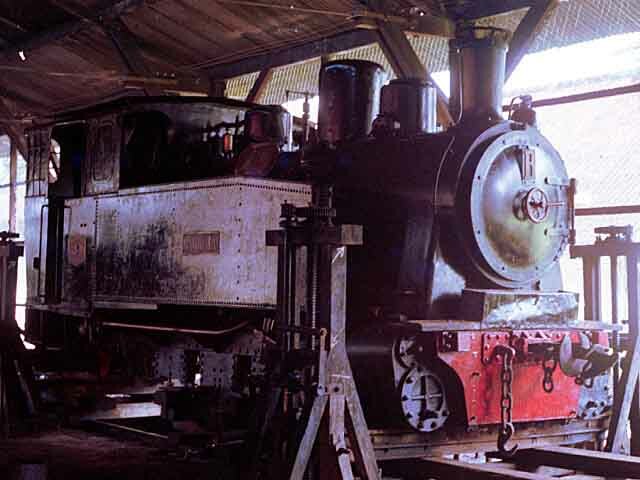 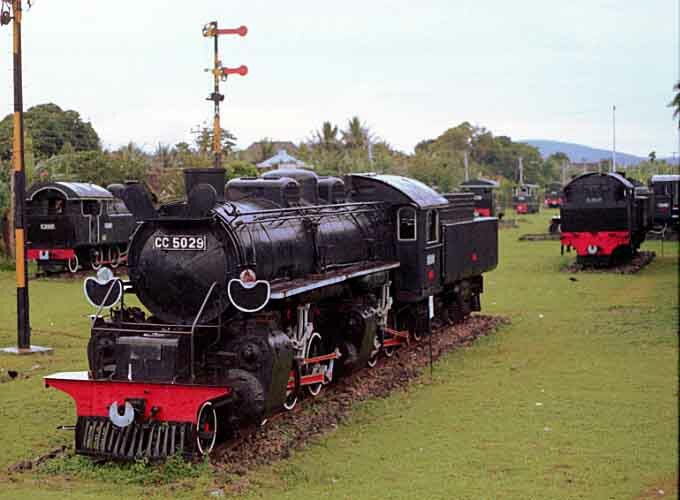 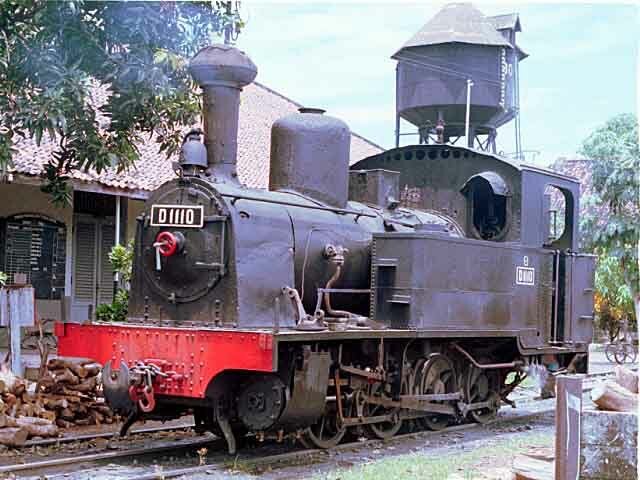 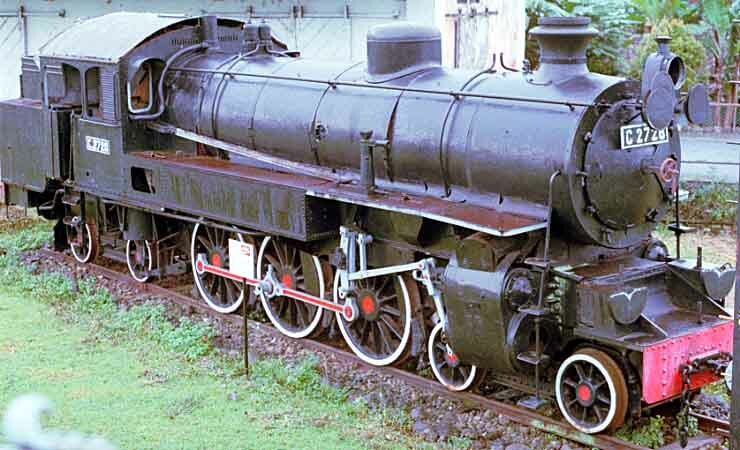 I then spent a day at Ambarawa museum which had aquired a few extra locos since my first visit. 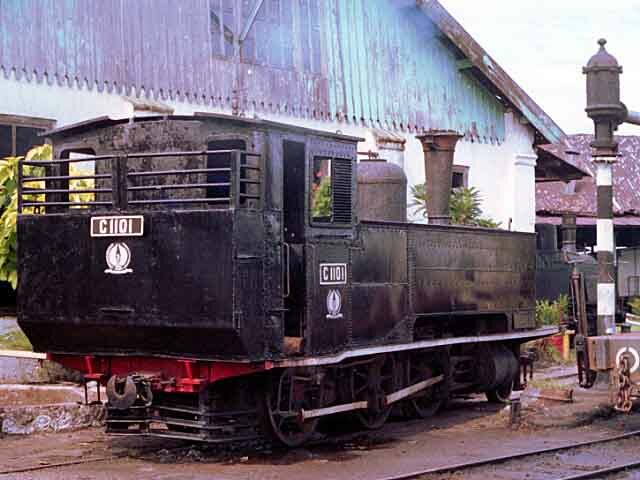 I then travelled to Jember, via Surabaya, and the following day visited Jati, Bangil, Malang, Blitar and Kediri. 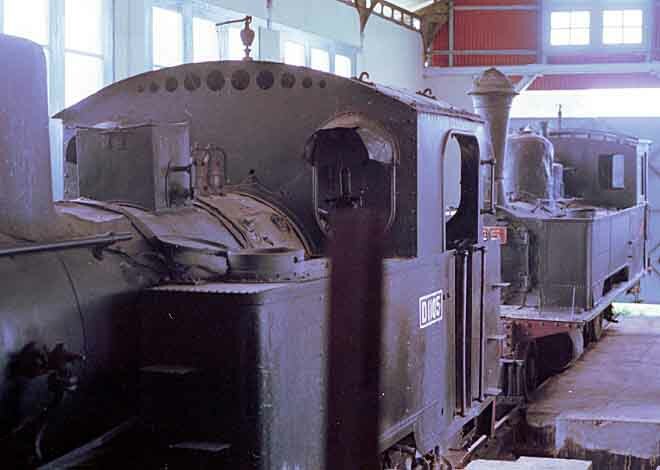 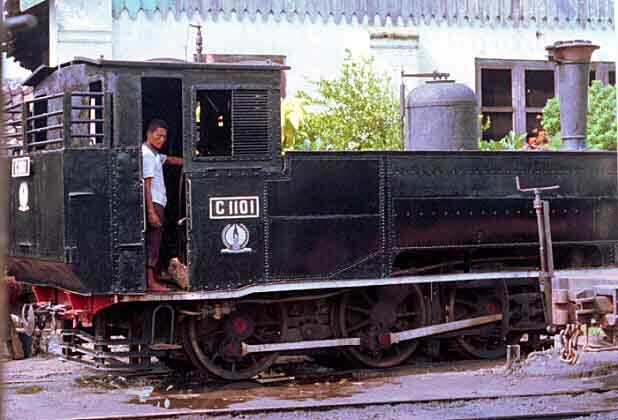 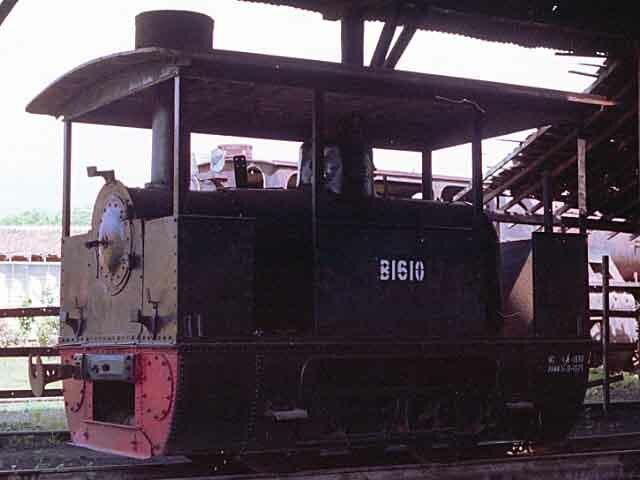 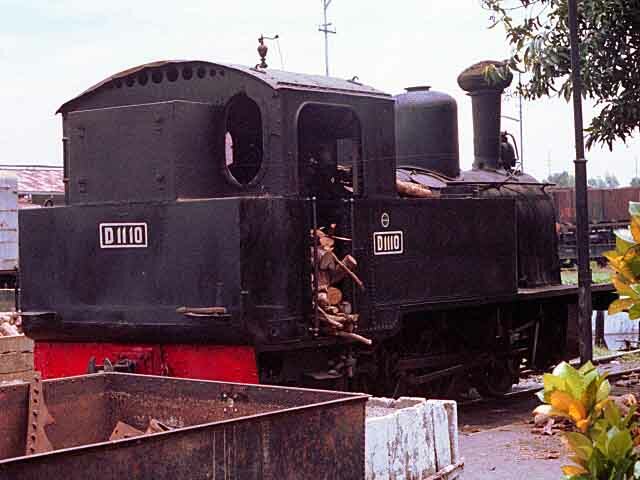 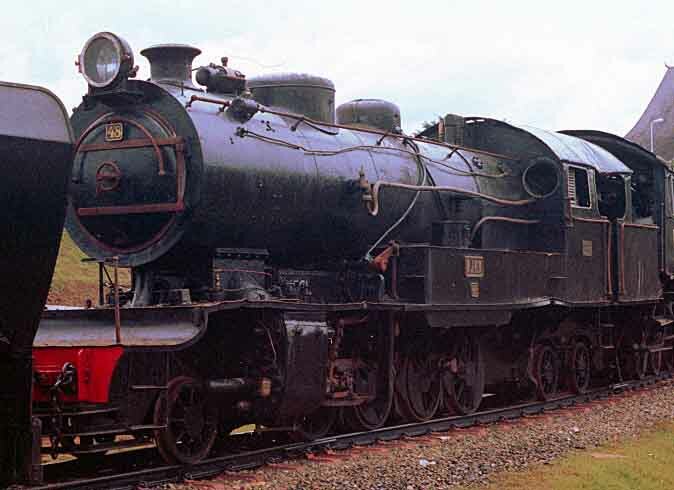 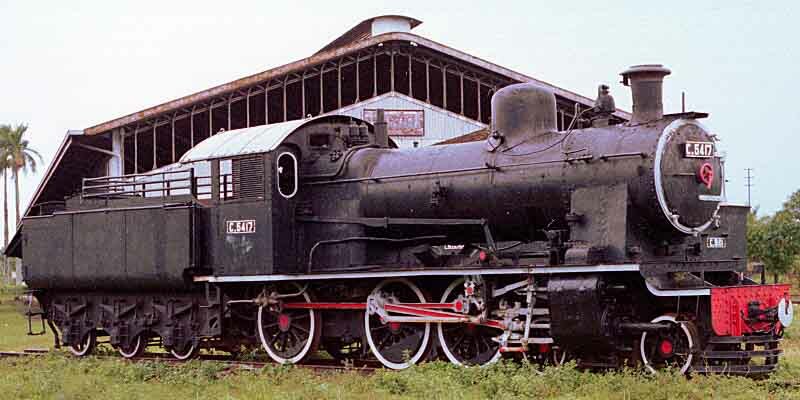 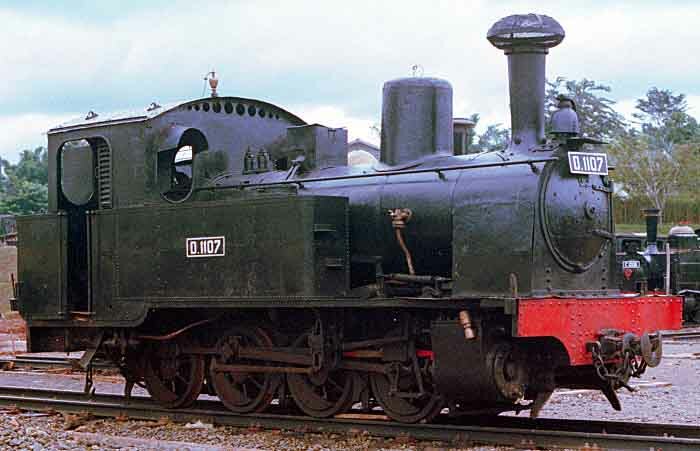 Bangil produced D1110 in steam in the yard and 4 other locos in a locked building, which was later unlocked to allow me to photograph the locos inside. 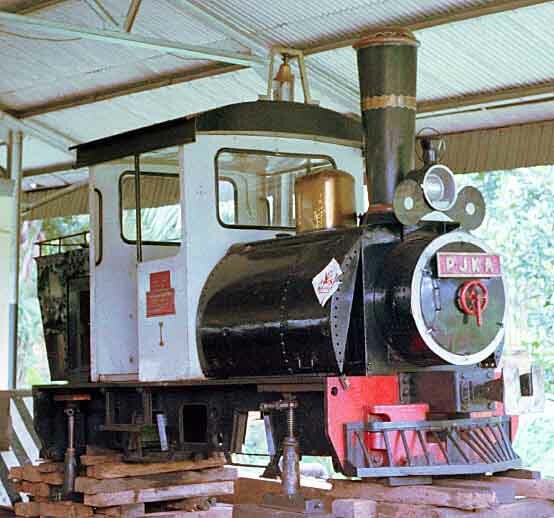 There was no sign of the preserved Pacific - I was told it had gone to the museum at Jakarta which was located at Taman Mini. 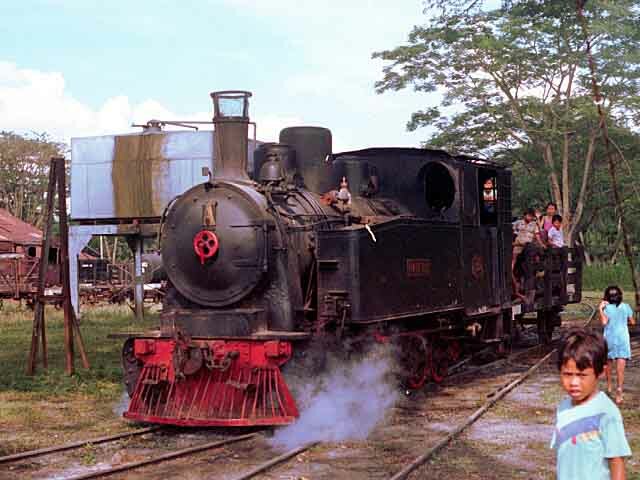 The next day I visited Pare, Kertosono, Madiun & Cepu, where one steam loco was working, before spending the night in Semerang. 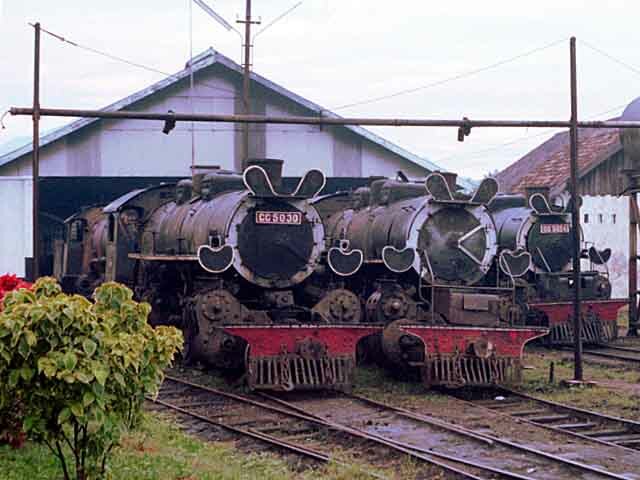 The next day was spent travelling back to Jakarta but I did see B1304 and C2856 in the shed at Jatibarang as we passed. 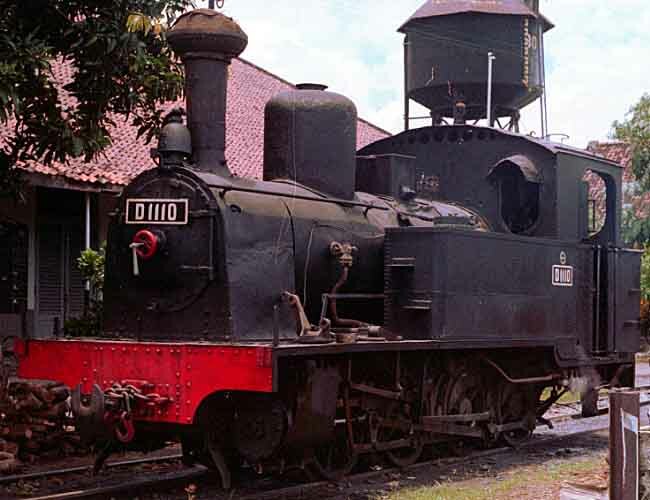 On arrival at Jakarta's Kota station I went in search of the museum locomotives which I had been told were stored there only to be told that they had been moved to Manggarai works. 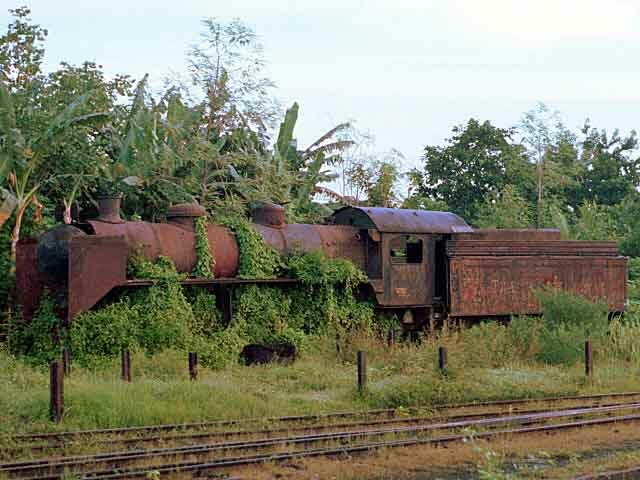 I would pass this in the morning on the way to Taman Mini which I planned to visit before catching the evening flight home. 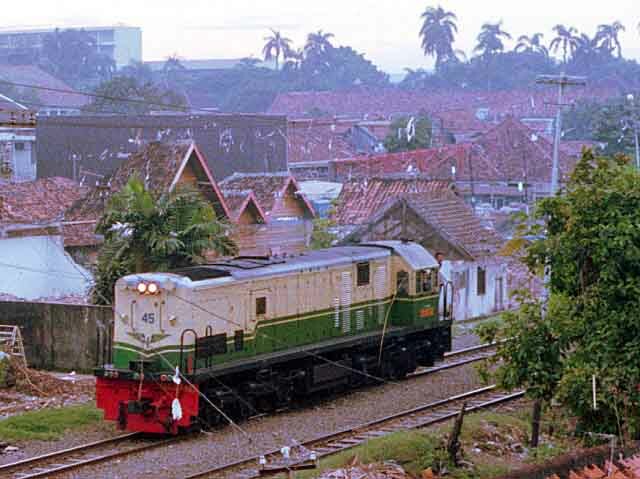 Its early morning on the 18th February in Jakarta and I am woken by the sound of CC20145 passing the hotel room (left). 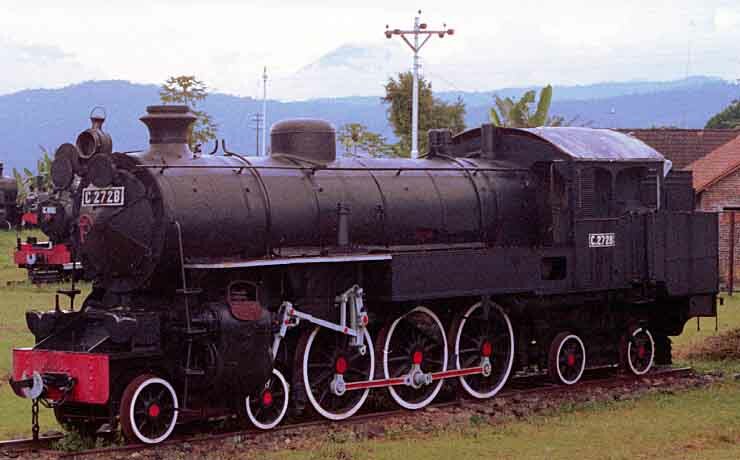 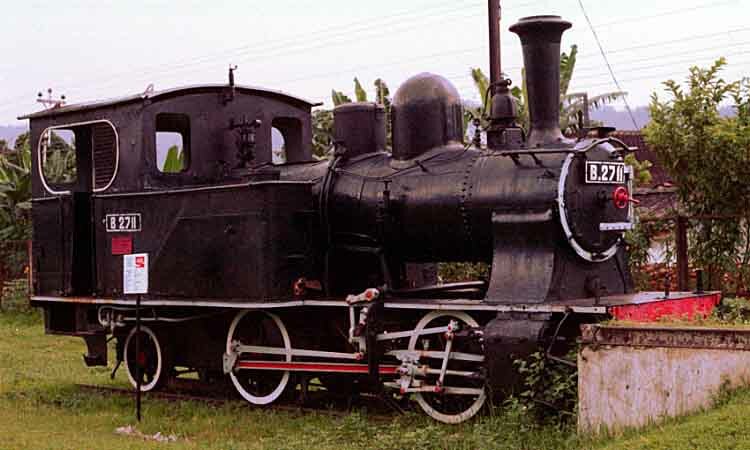 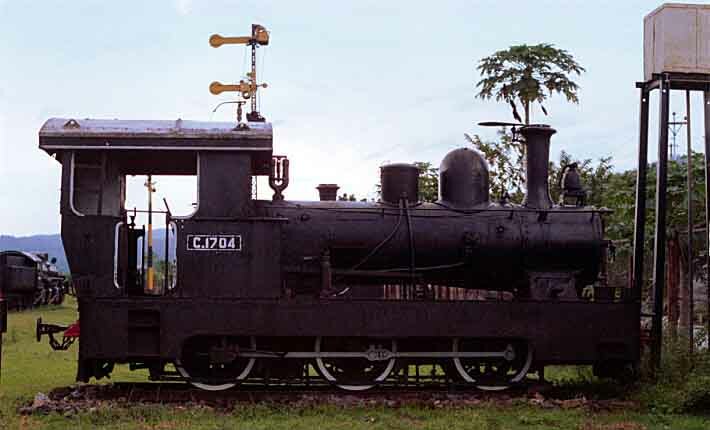 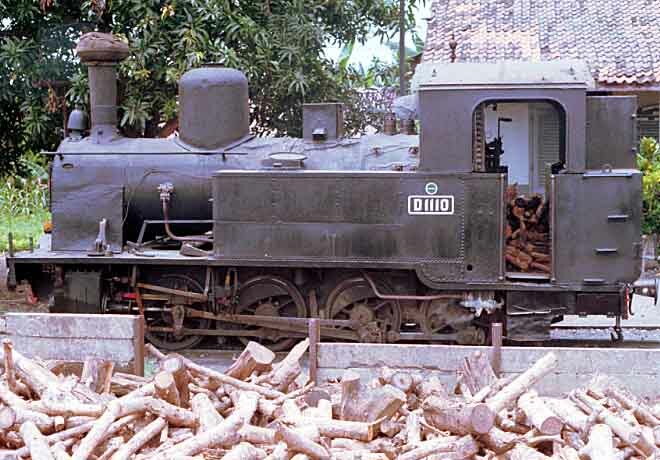 Later that morning I took a train to Bogor where I photographed D1422. 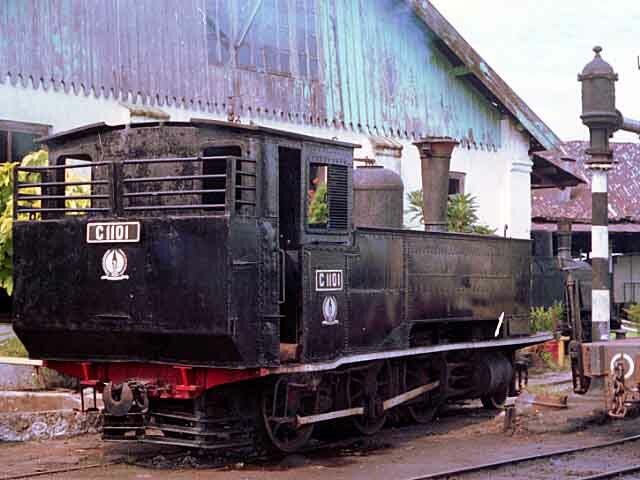 Having stayed in Bandung overnight I caught a train to Surakarta early the next morning, behind CC20131 and CC20106. 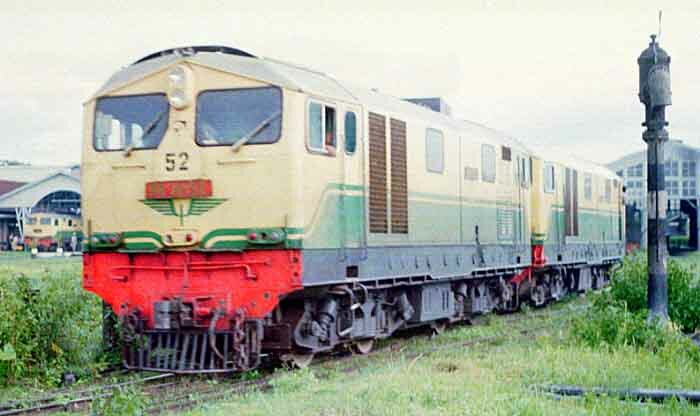 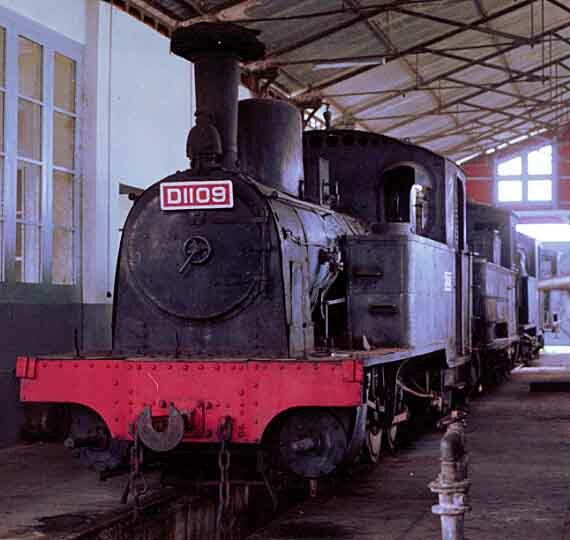 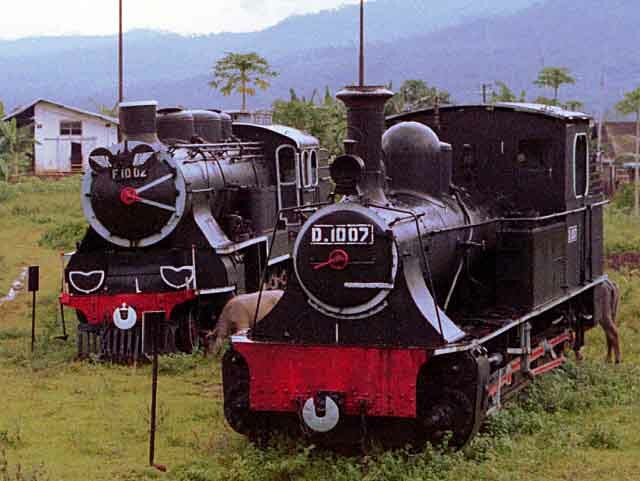 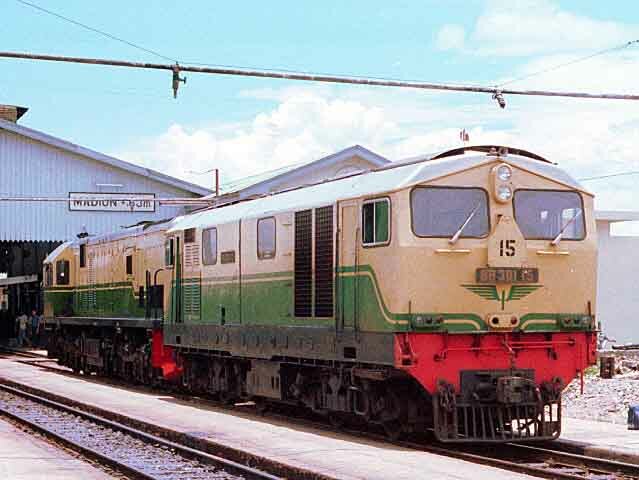 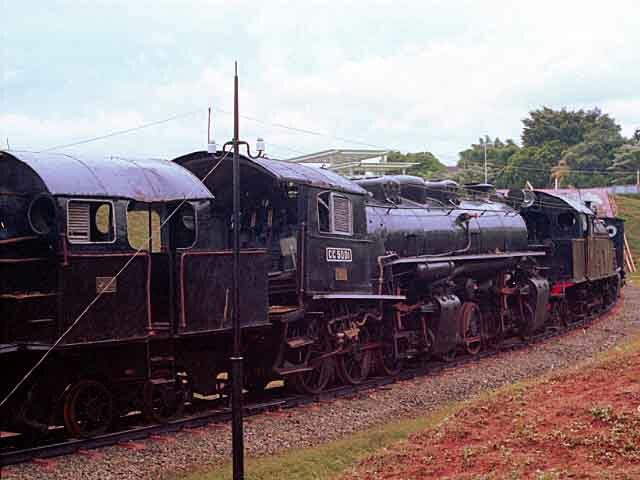 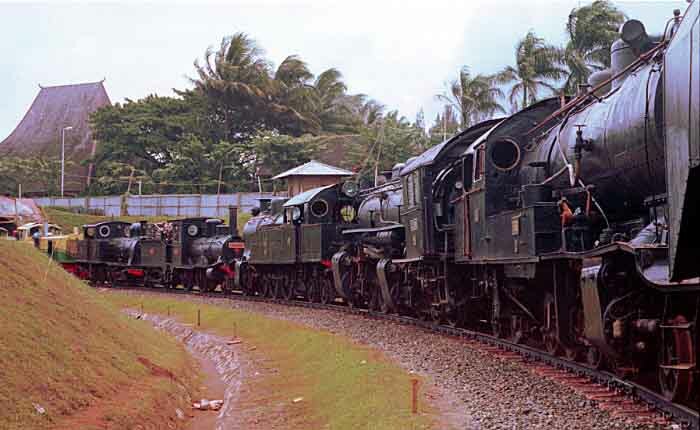 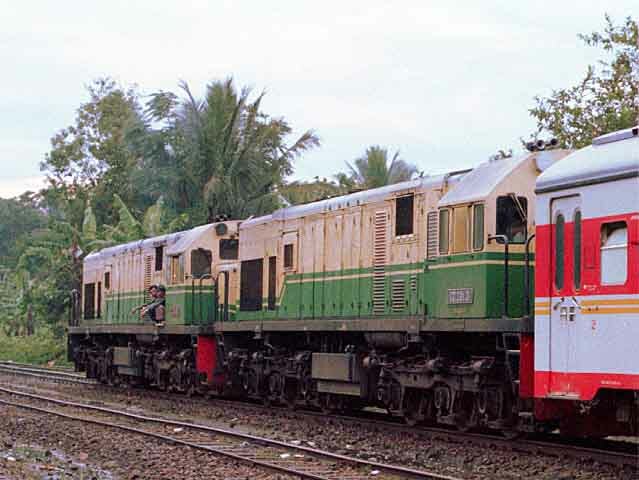 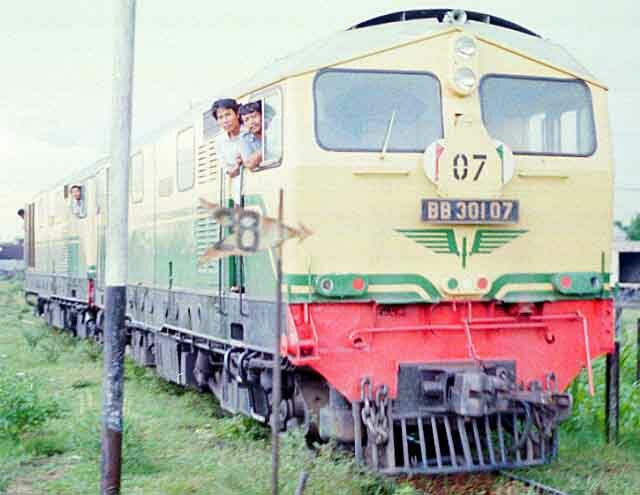 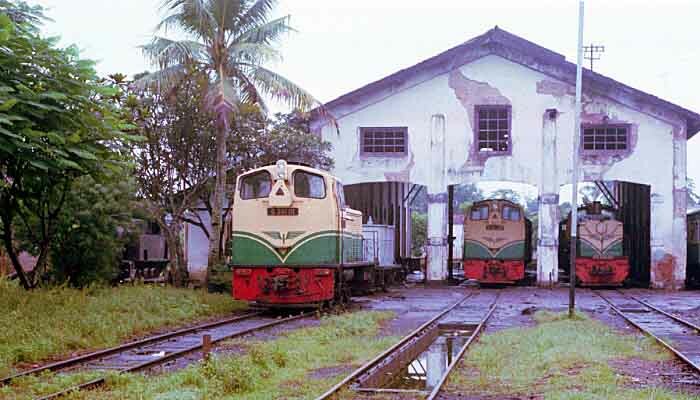 Four more D14s were stored at Cianjur, the 2 nearest being D1404 and D1423. 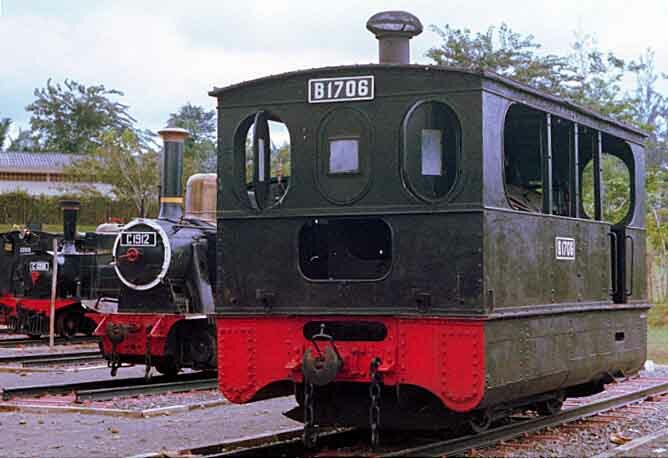 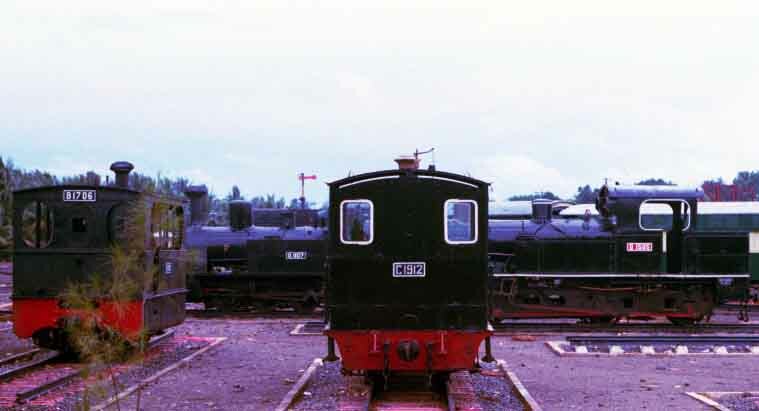 D1407 and D1411 are at the back. 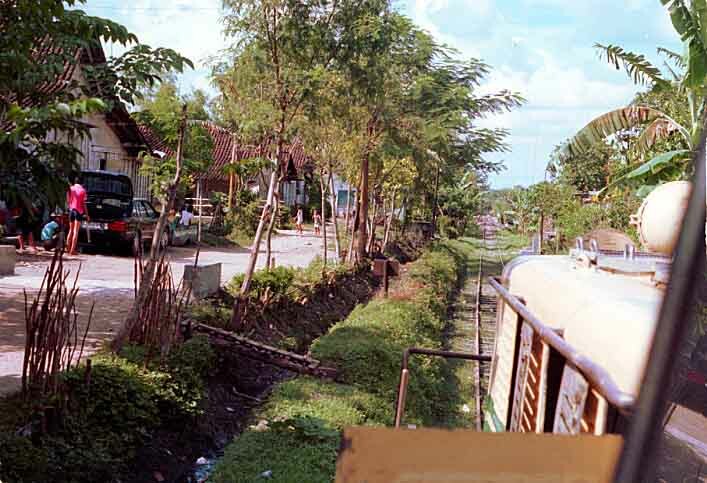 During the journey we had to stop at many passing loops. 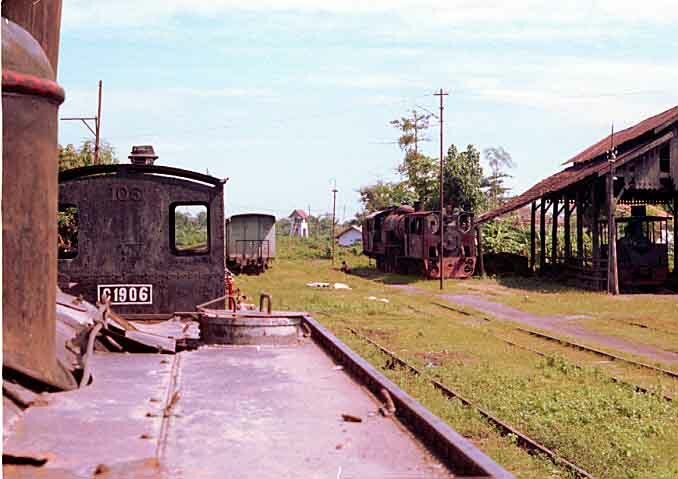 Passing Cibatu I photographed each end of the depot, left. 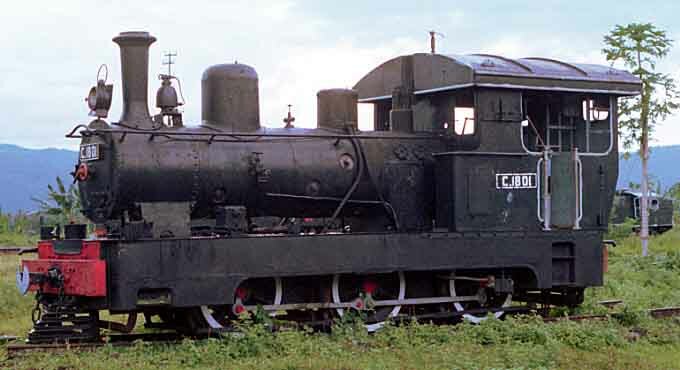 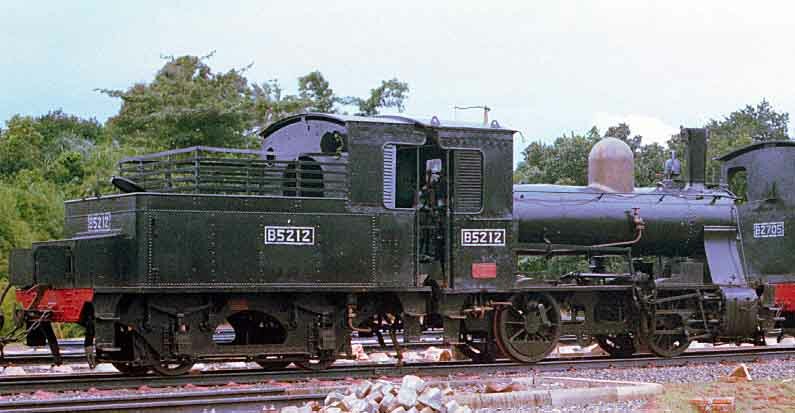 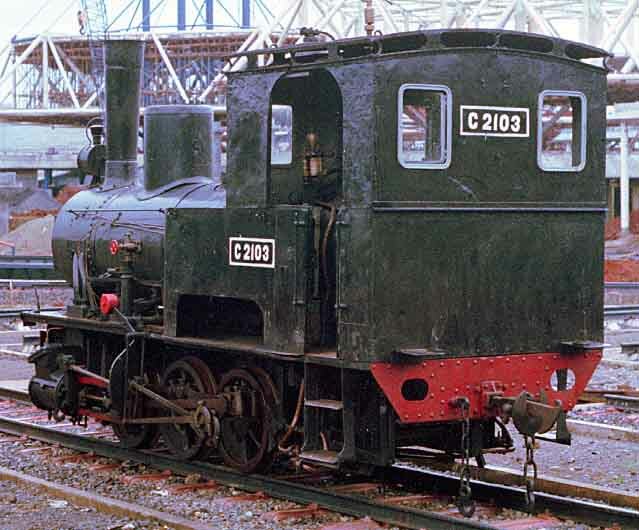 C1116 and C1127 were still present as were most of the CC50 mallets. 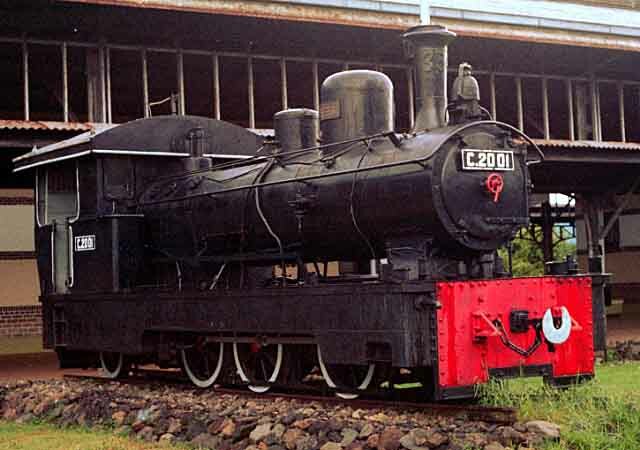 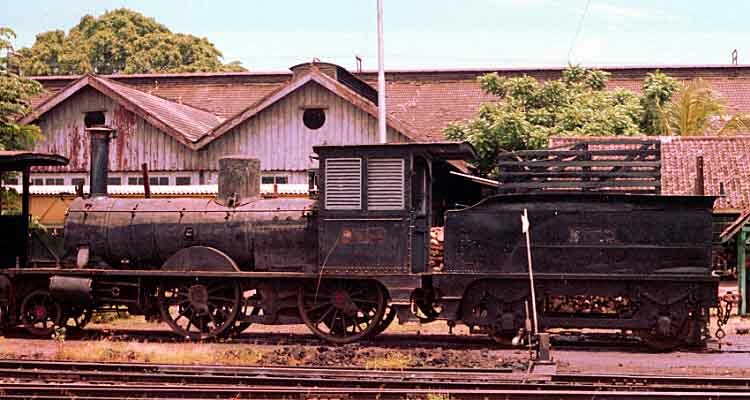 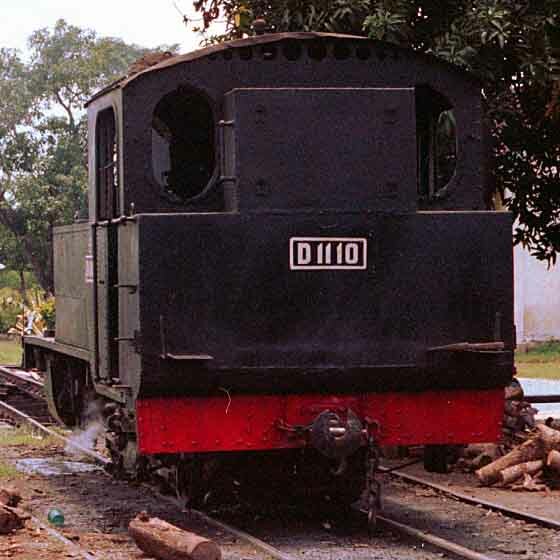 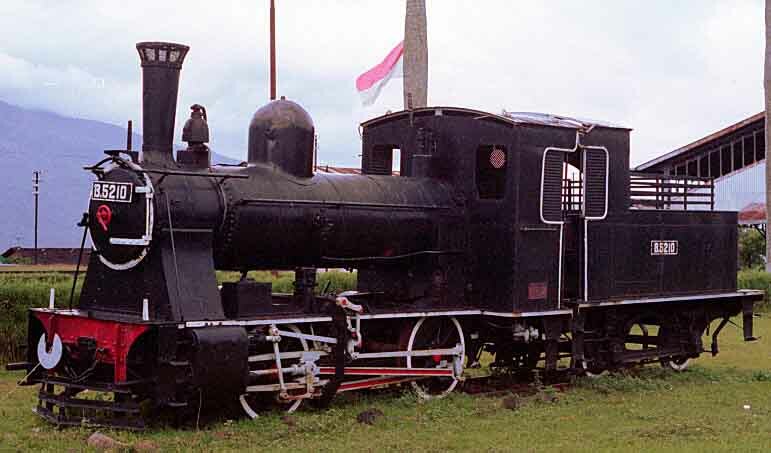 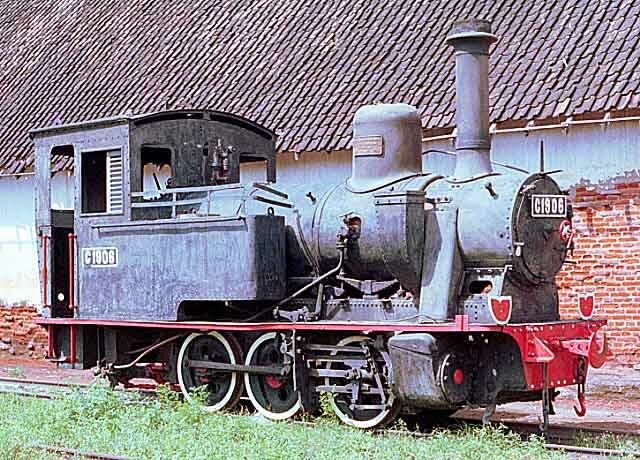 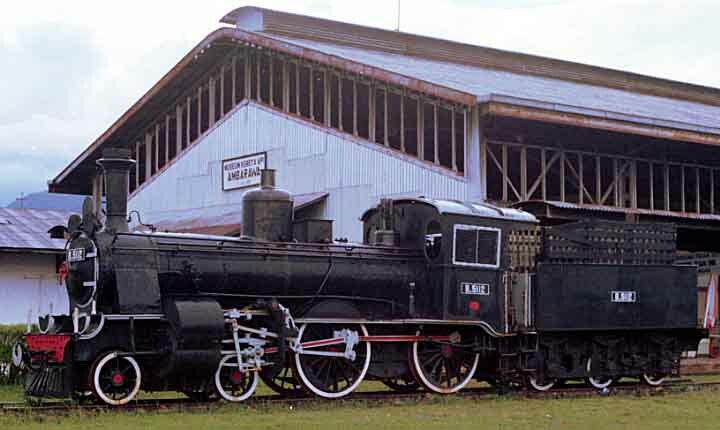 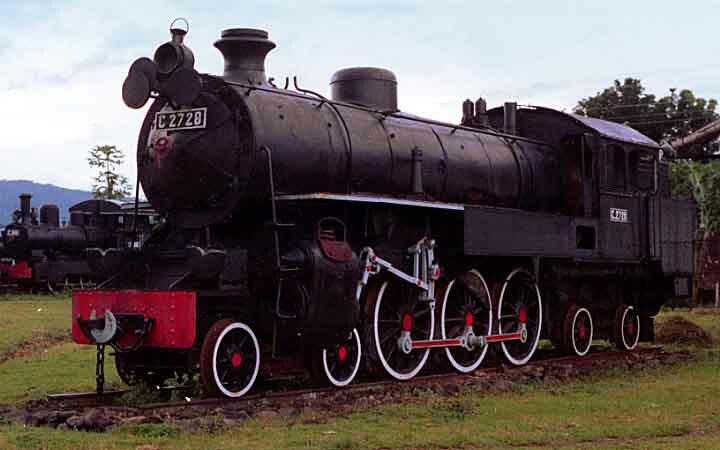 Kutoarjo had this unidentified D52 (with D52011 tender) outside the shed and several more steam locomotives could be seen inside, probably all D52s. 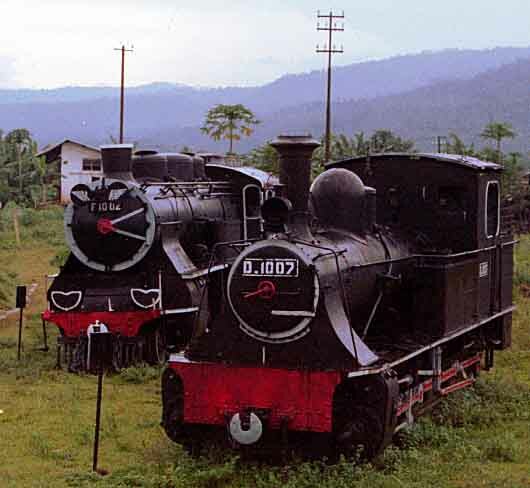 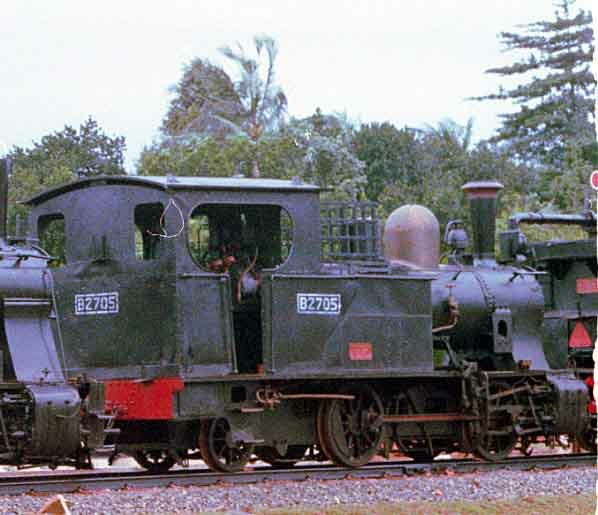 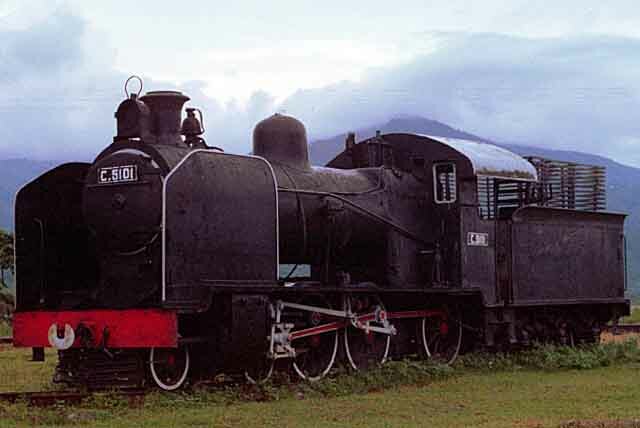 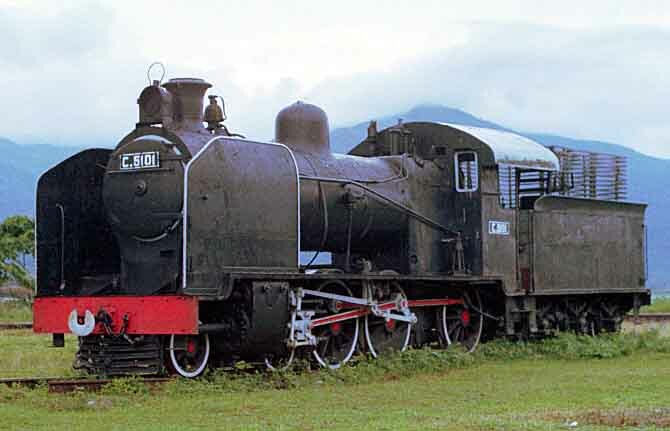 At Banjar C1139 (left) and D52080 were still present along with another 2 D52s. 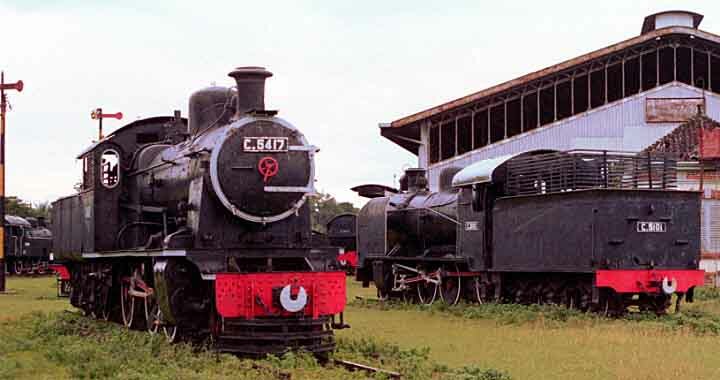 C5107 and D52001 were still at Kroya. 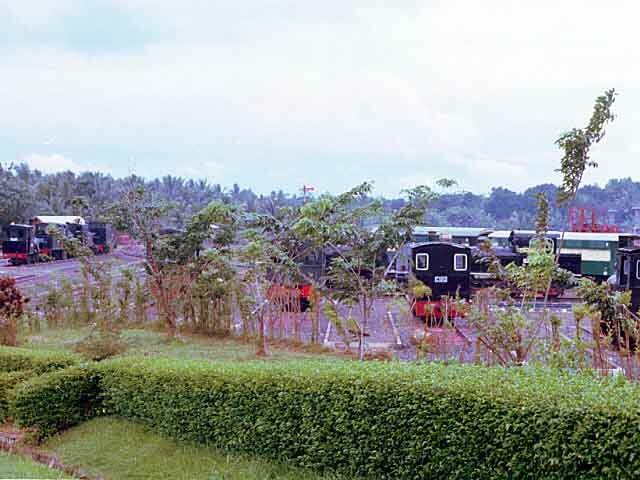 Solo (Surakarta) has two sheds and on the morning of the 20th I went first to Purwosari which contained D52044 and C2412 as well as several diesels. 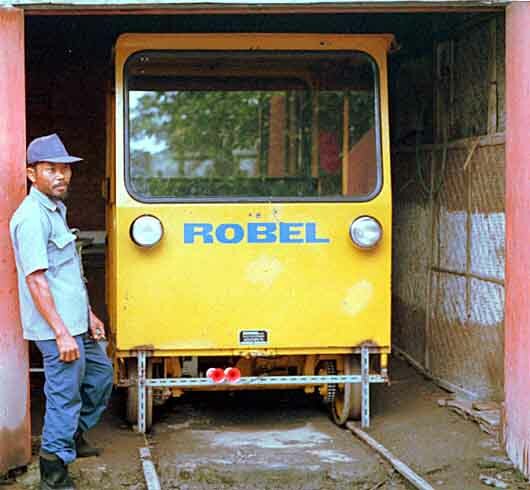 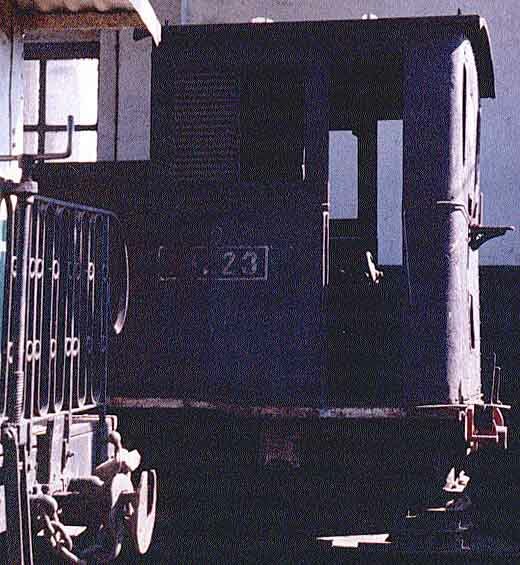 In a nearby shed was a small 4-wheel railcar. 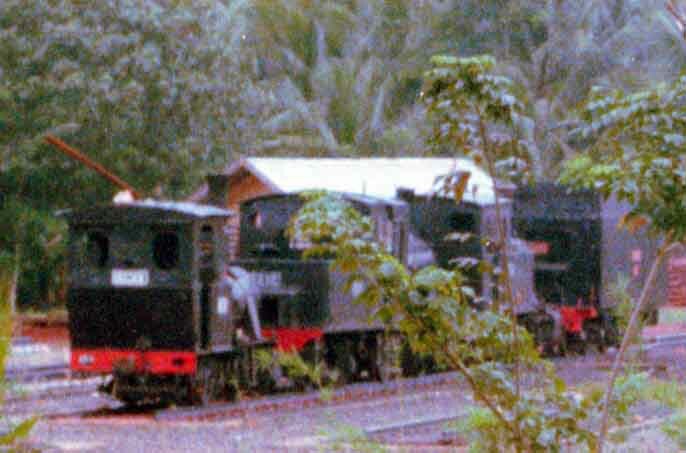 Solo Balapan had only CC20134 and CC20149, far right, lower. 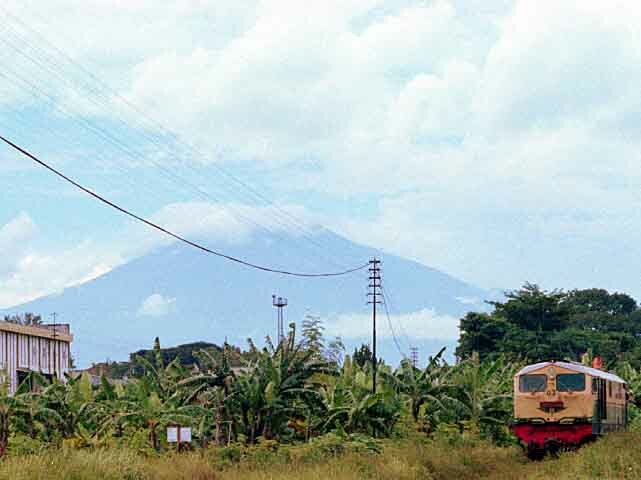 In the afternoon I went to Ambarawa for the first time for more than 10 years. 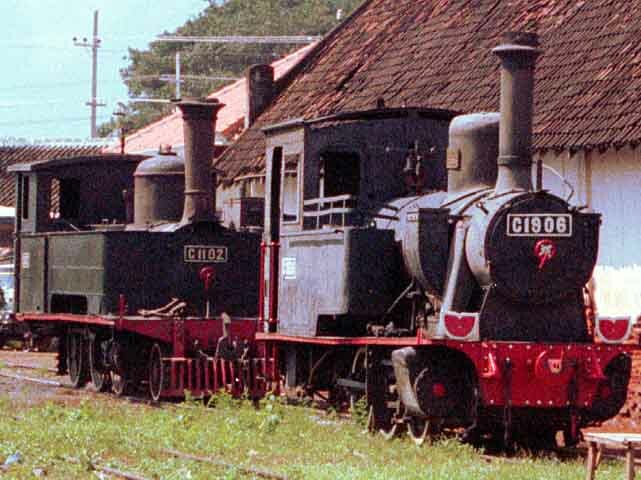 Little had changed in that time, except for the addition of 3 dumped locomotives, C1412, C2301 and C1507, and the disappearance of B2505 which had previously been in steam. 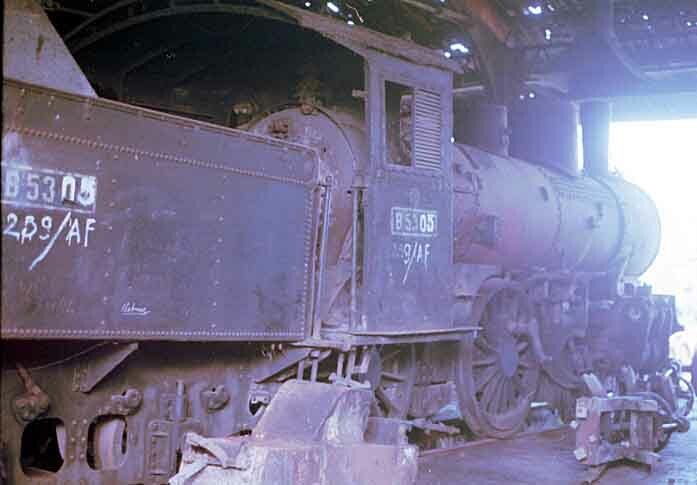 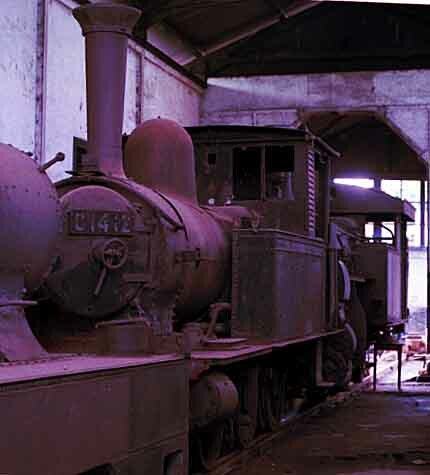 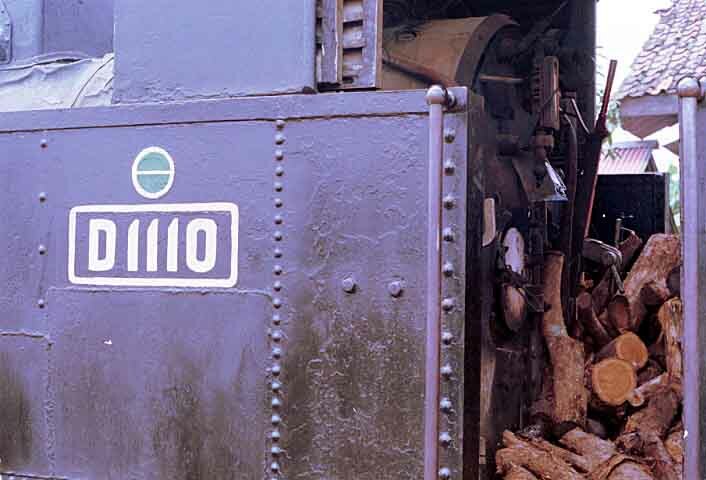 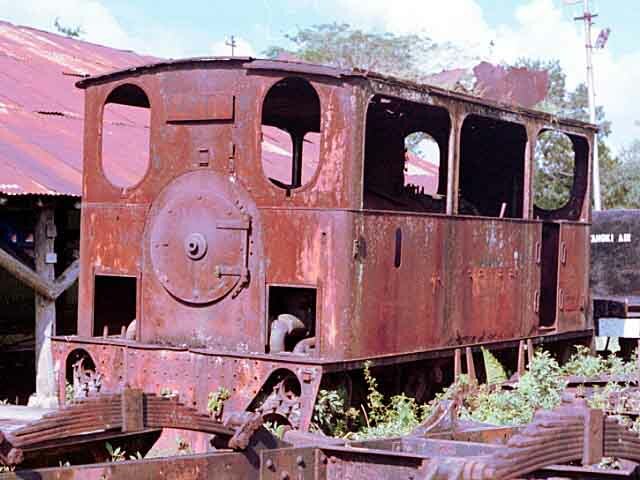 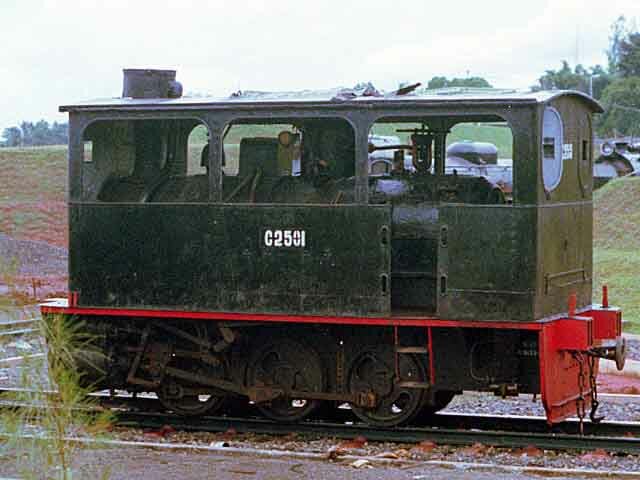 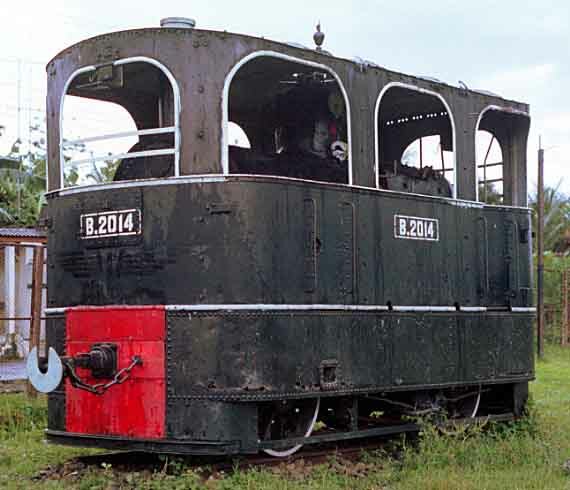 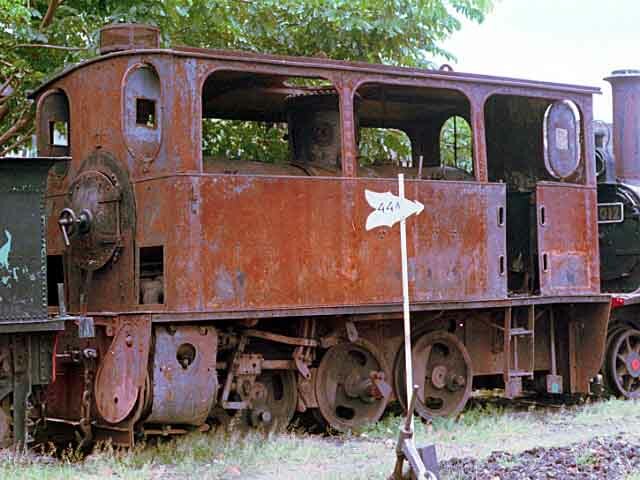 Many of the museum locos had been freshly painted and motiom parts had been refitted in most cases but some large rust holes were appearing on some. 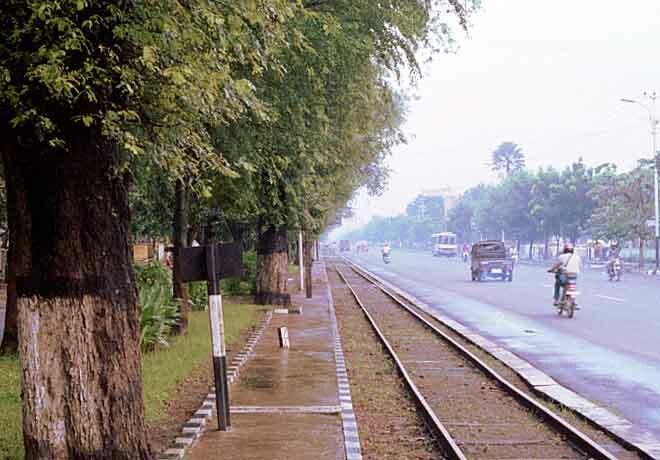 Compare the photographs on the left with those taken in 1976. 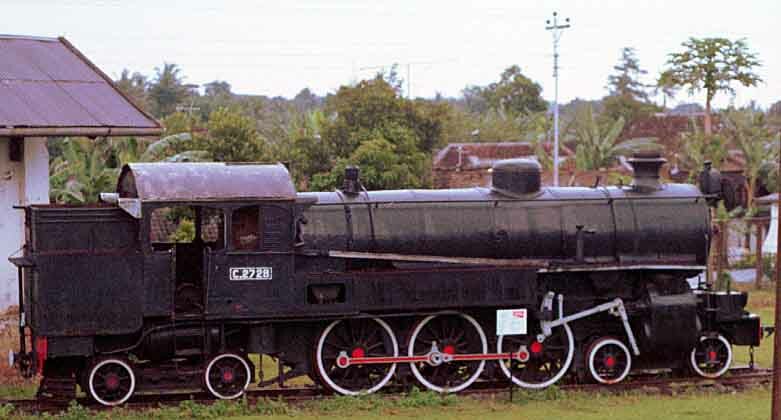 On the 21st I took a train from Surakarta to Jember. 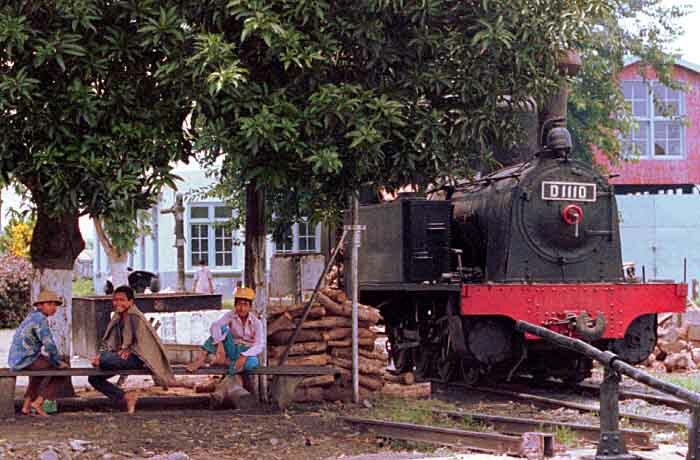 At Madiun we stopped opposite the shed and works. 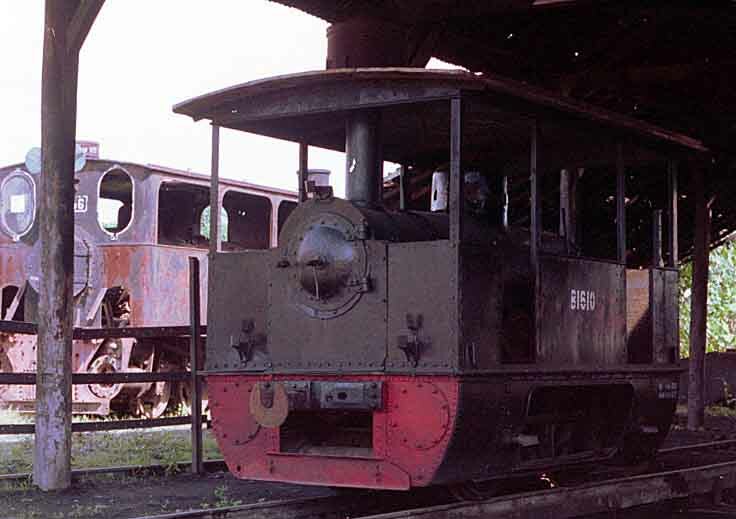 As we were leaving the locomotive failed and we were shunted back into the station. 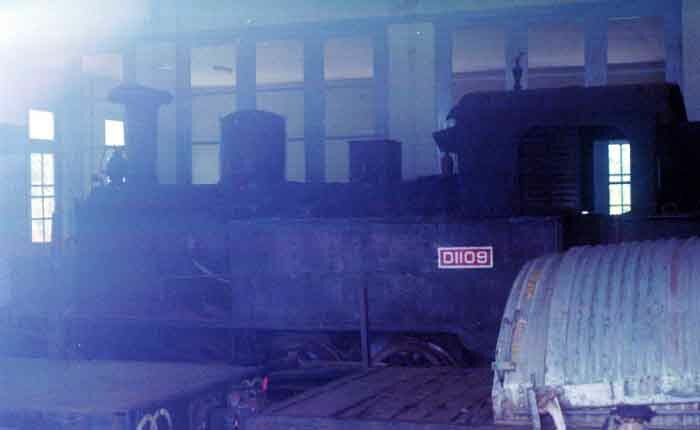 This gave me a chance to take the photographs on the right (first 2 columns). 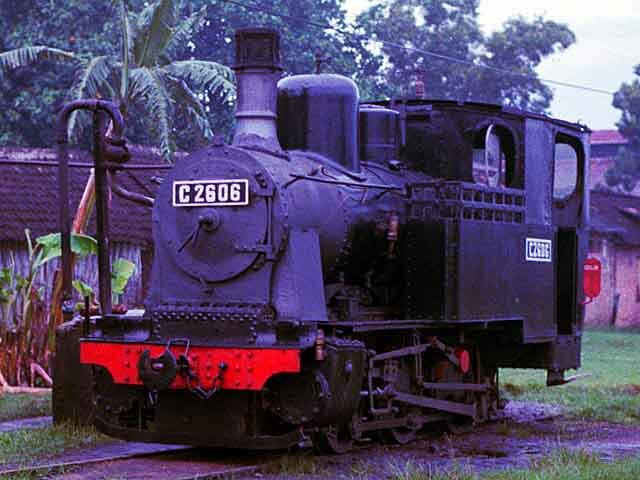 It was dark when we arrived at Jember so I had to wait until the next morning to see what was there. 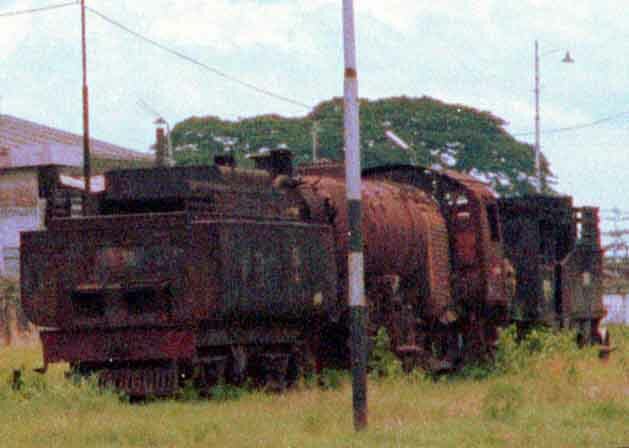 F1020 and D5028 had been dumped for so long they were now part of the scenery. 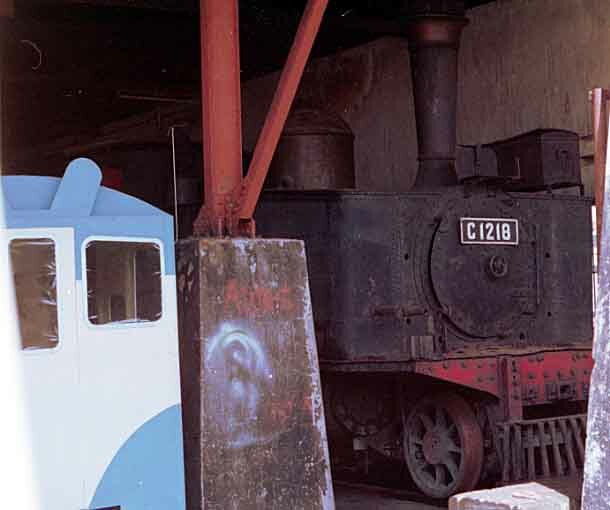 The next stop was Klakah where C1223 and C1233 were stored serviceable inside the small shed. 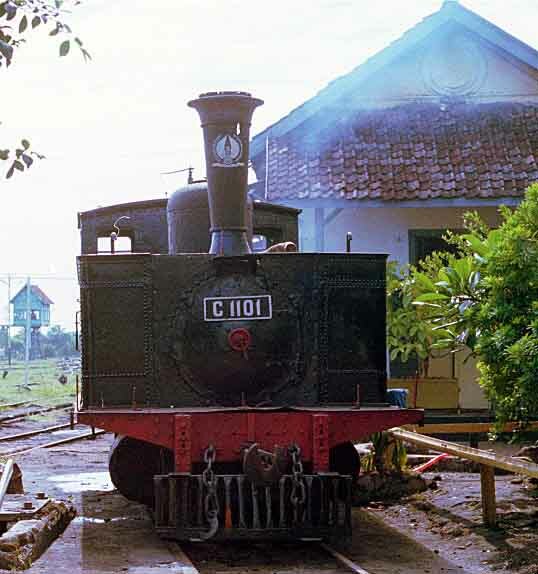 Jati (Probolinggo) was the next stop. 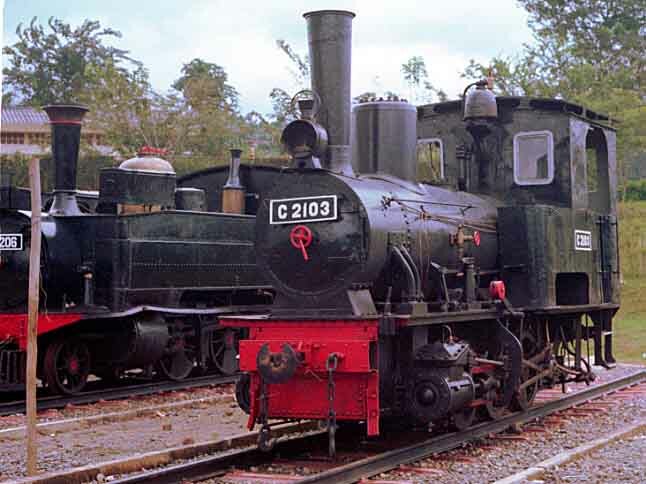 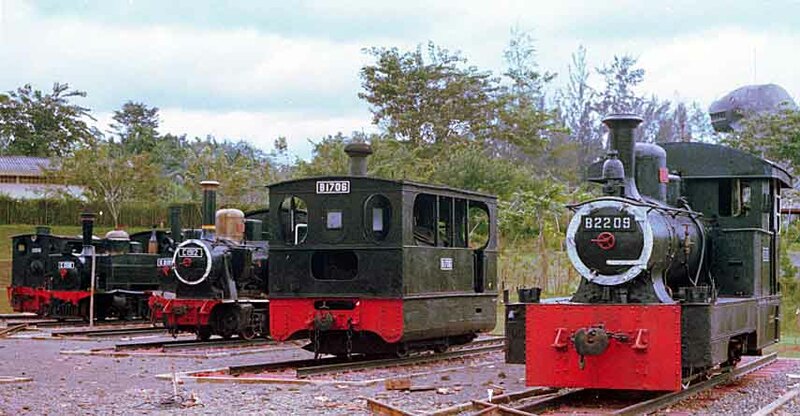 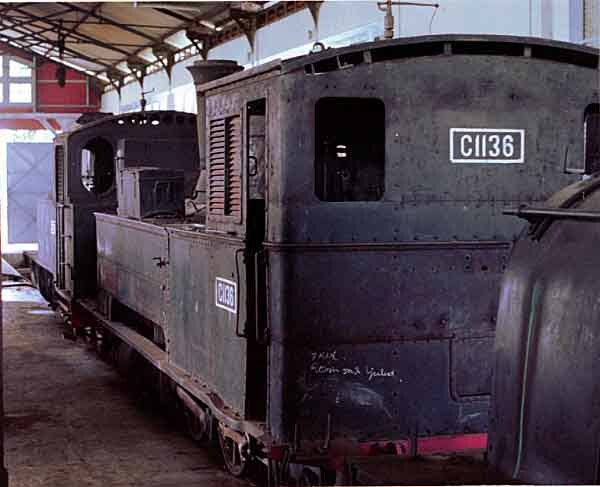 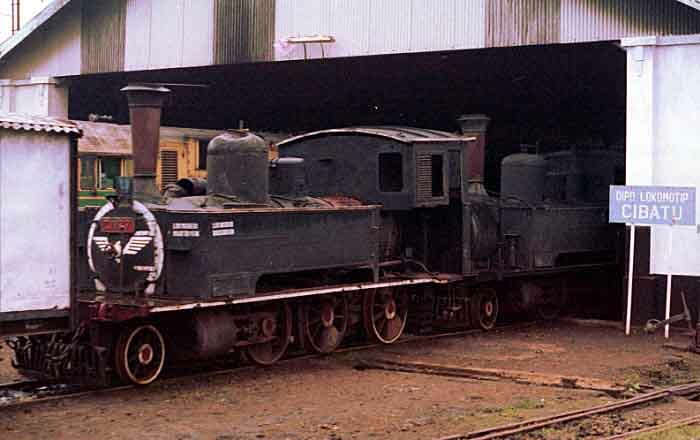 Two of the locomotives here were serviceable (C1102 and C1906) and one had been shunting the docks the previous day. 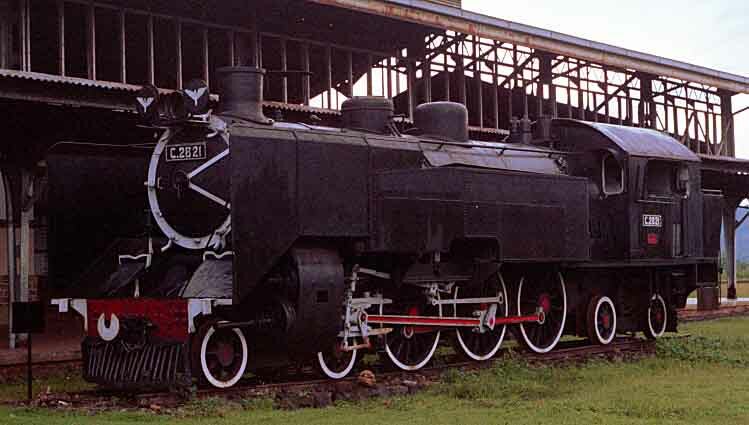 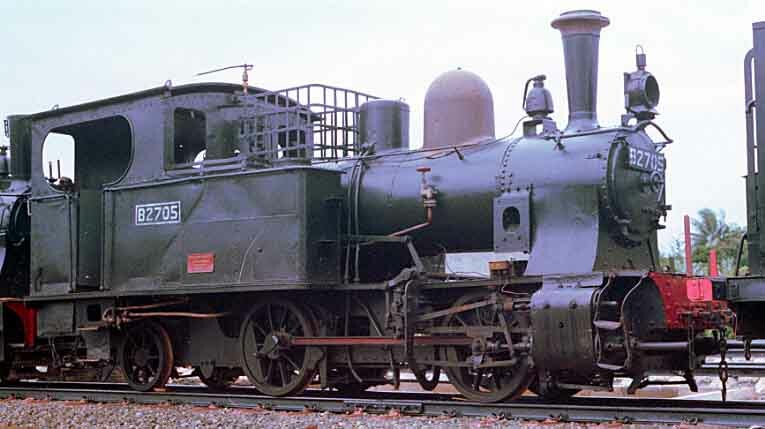 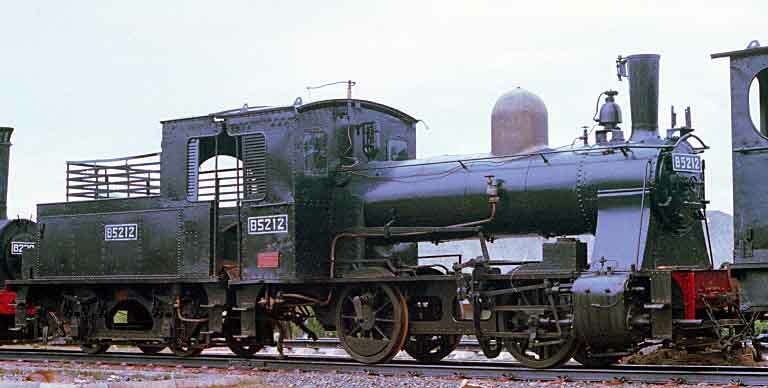 C2506 had previously been numbered D1201, creating a non-existant class. 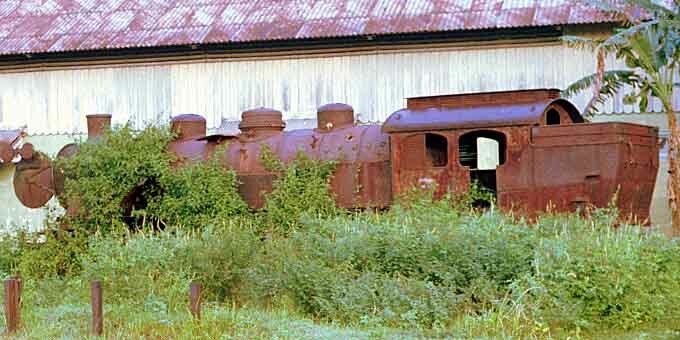 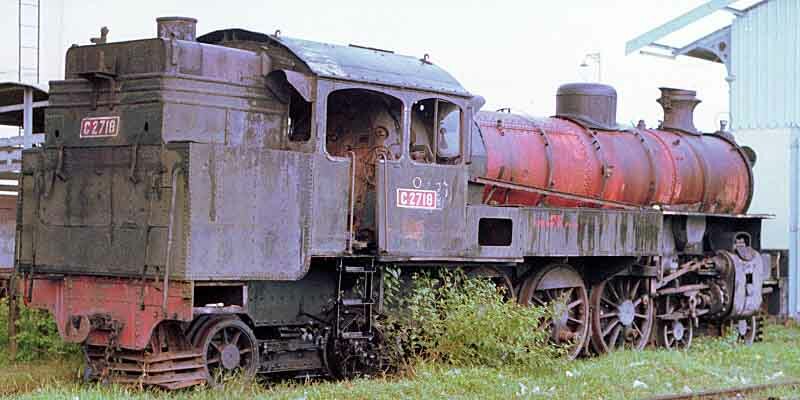 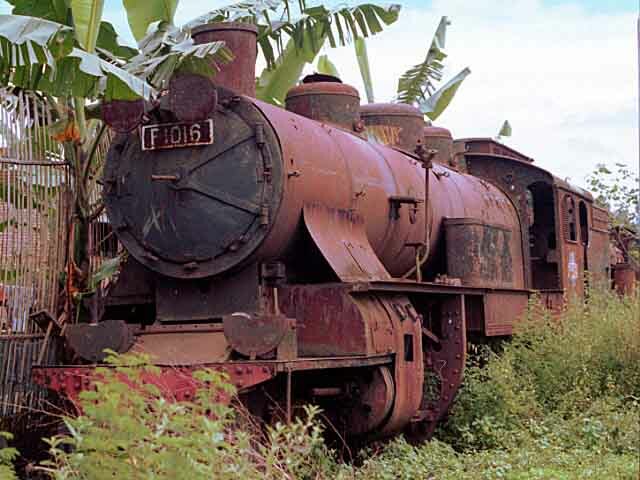 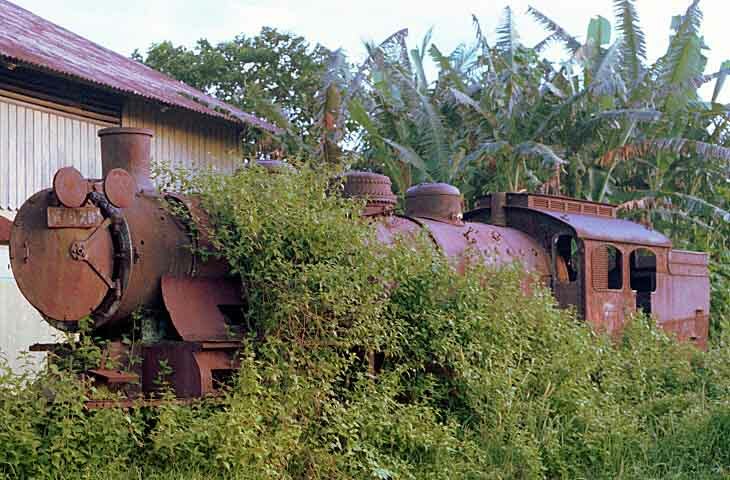 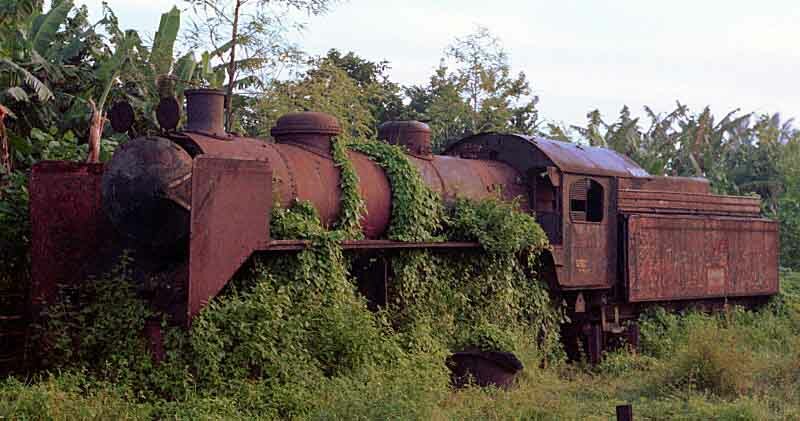 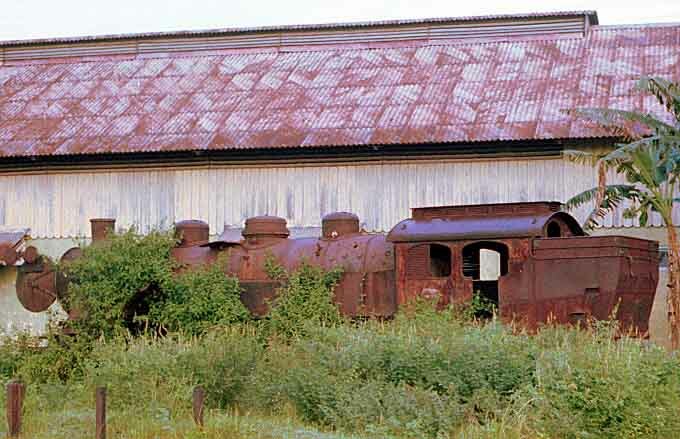 It was now derelict along with F1006. 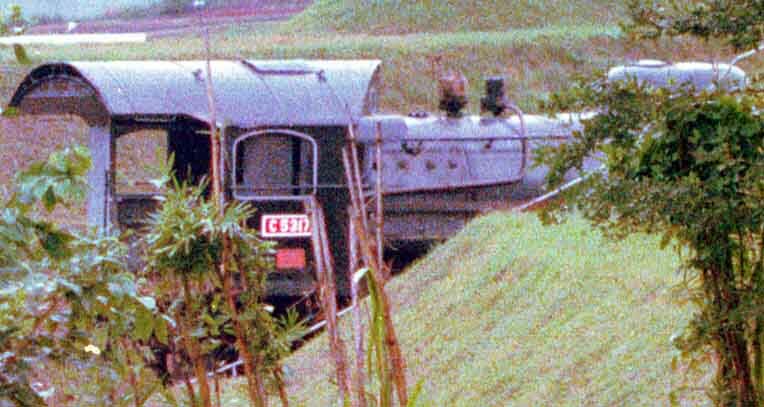 B1610 was stored under cover. 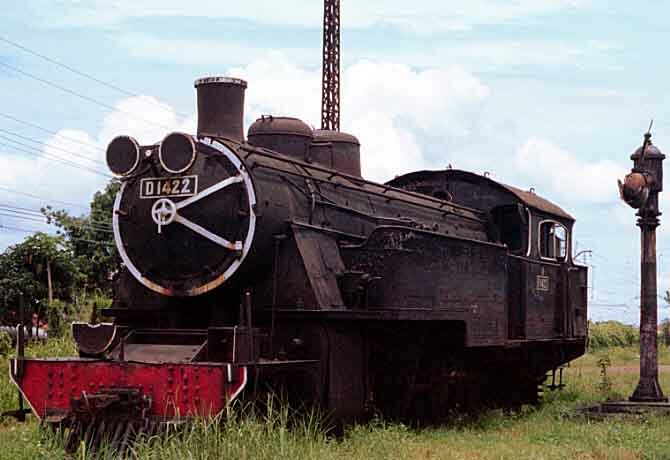 At Bangil I finally found what I had been looking for. 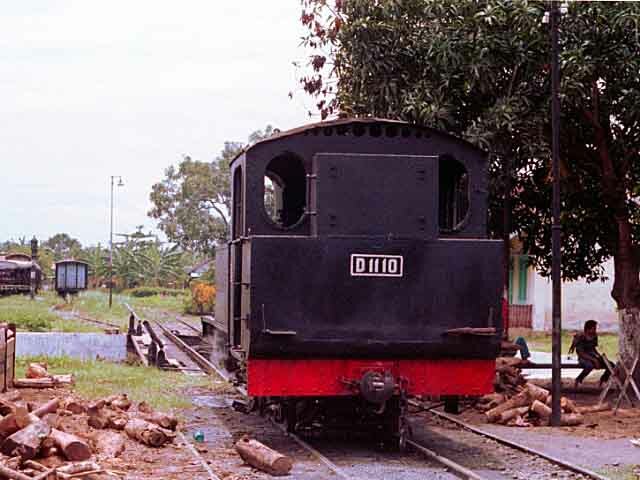 D1110 was sitting by the turntable in steam, being prepared for an afternoons shunting in the nearby yard. 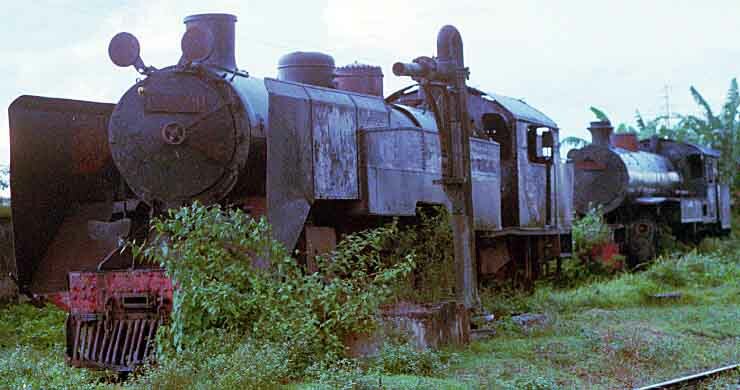 Unfortunately I could not see it in action as there were several more places to visit that day and it would be another 3 hours before it was ready to start working. 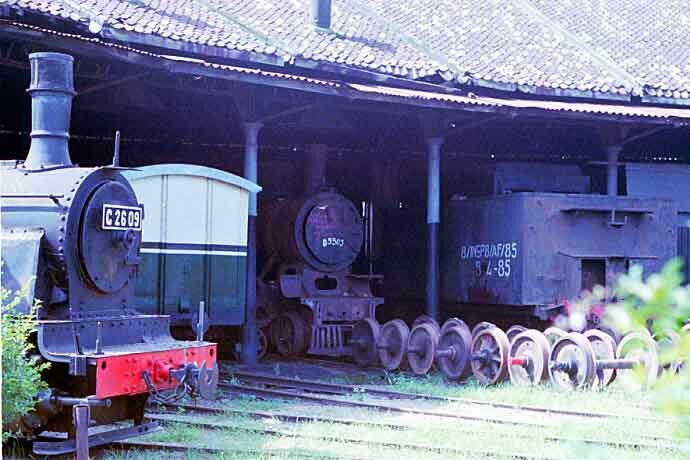 There was time, however, to photograph the stored locomotives in the shed. 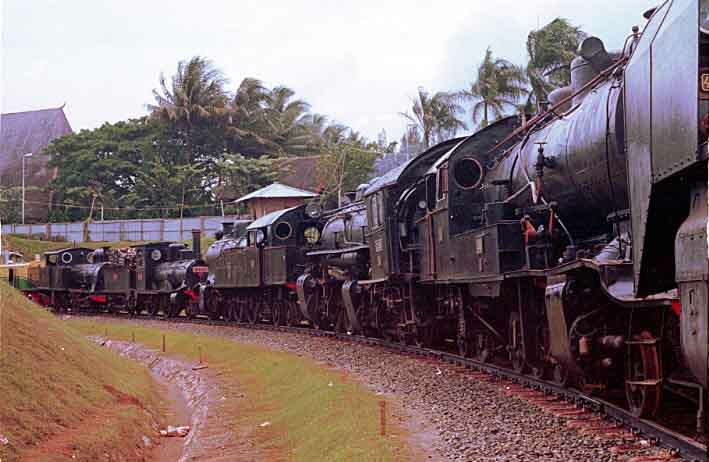 The preserved pacific, C5317, was nowhere to be seen; I was told it was now at Jakarta Kota. 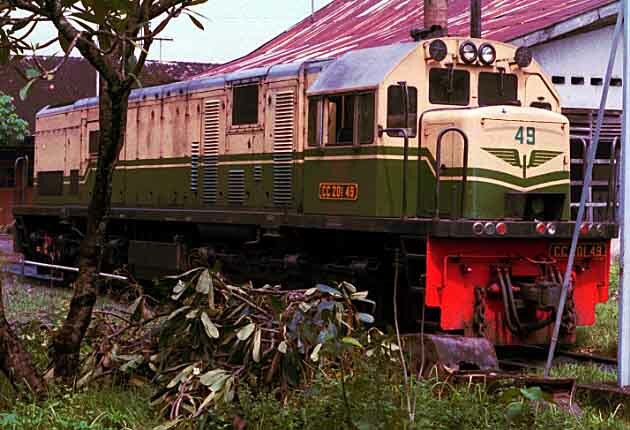 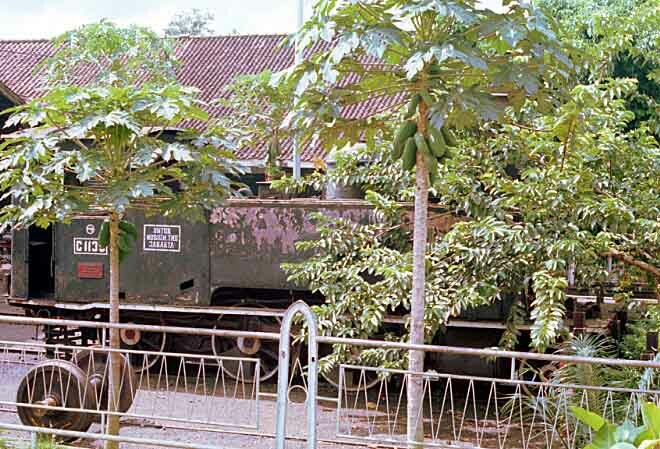 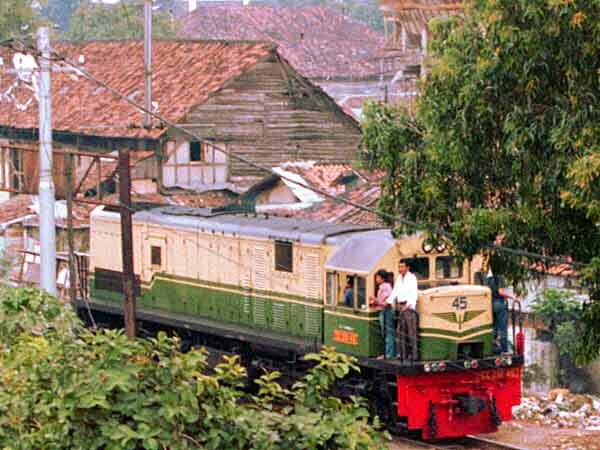 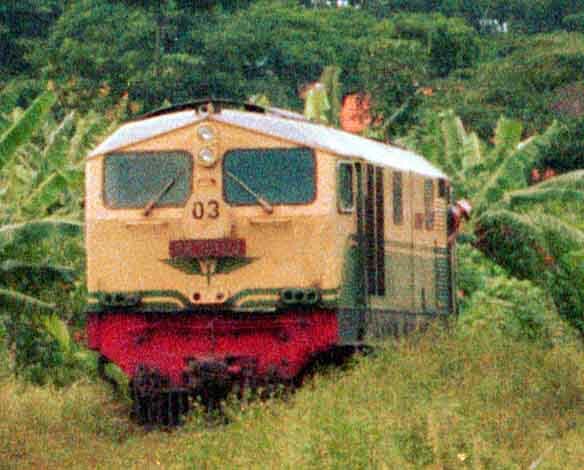 Malang used to be the home of all the D11s but now only F1007 and F1016 remain to haunt the diesels while the D11s have fared somewhat better. 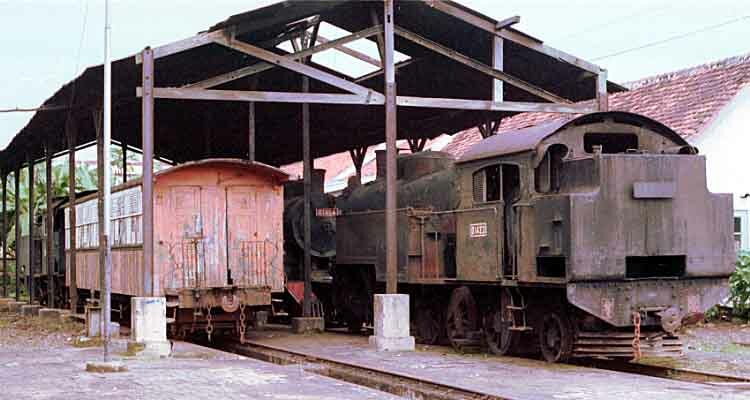 I arrived at Kediri in the evening to find C2606 stabled in the yard, dead but apparently serviceable and very recently used (right). 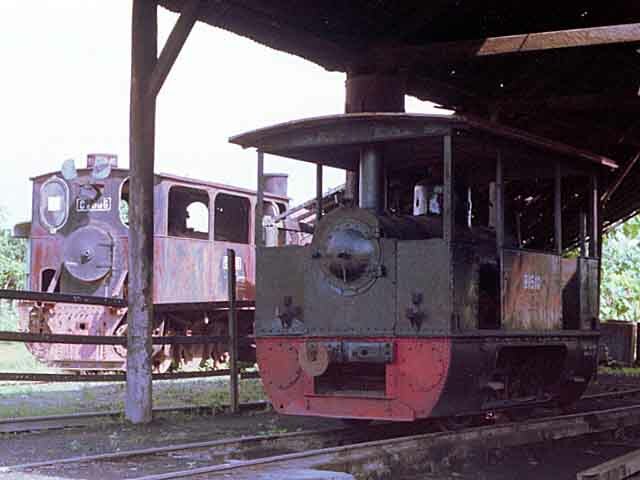 The next morning, the 23rd, I visited Pare where the only occupent of the shed was C2604 (left). 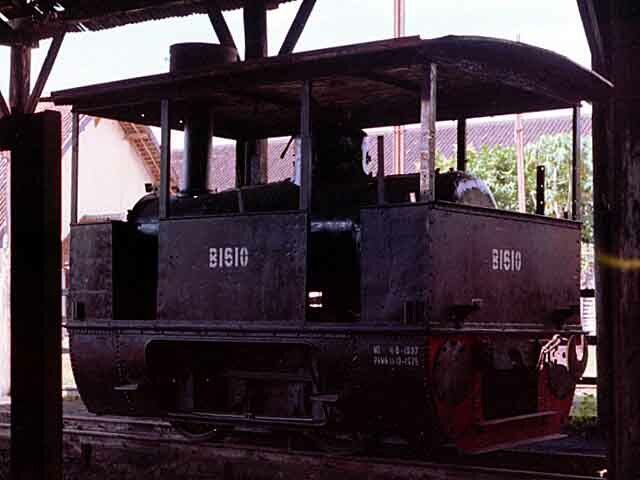 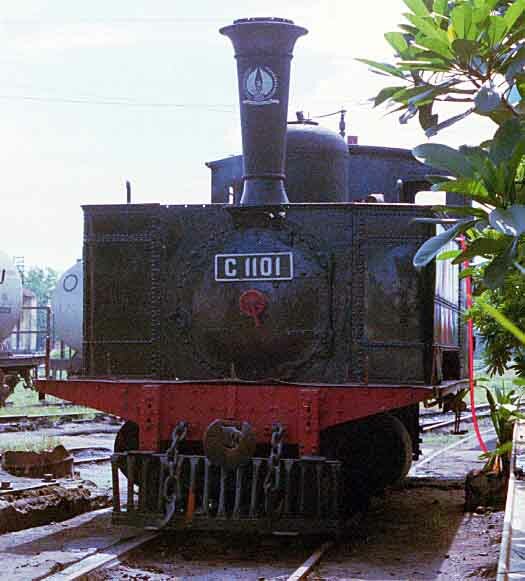 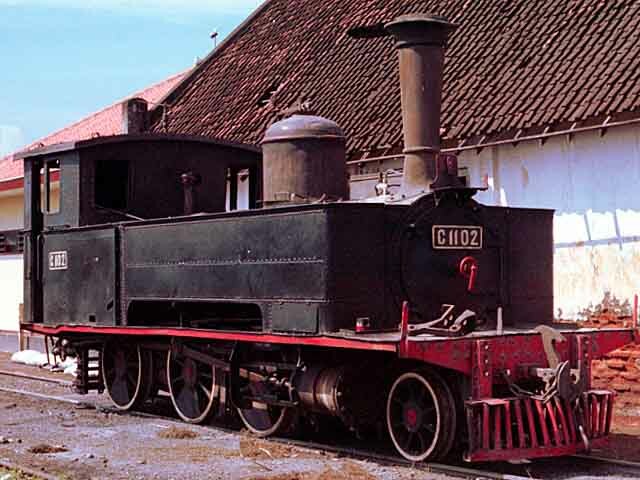 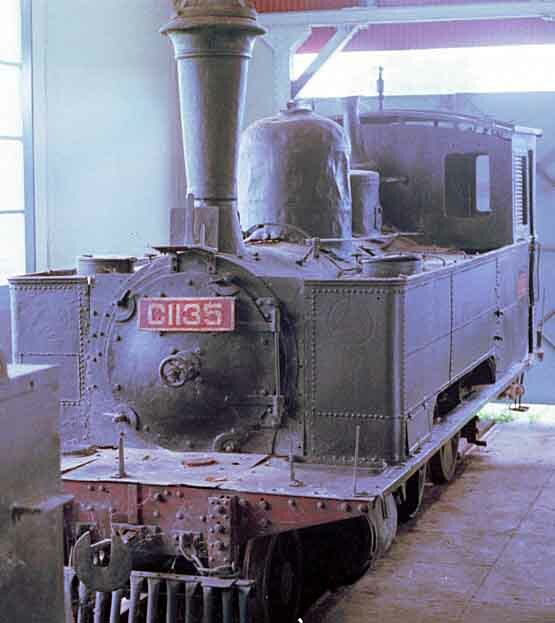 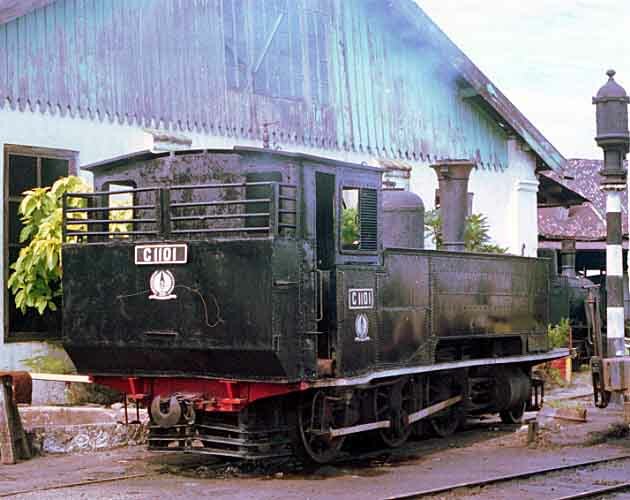 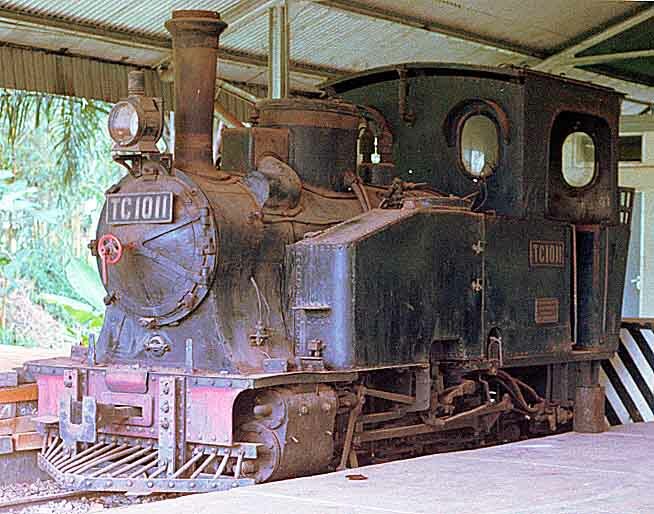 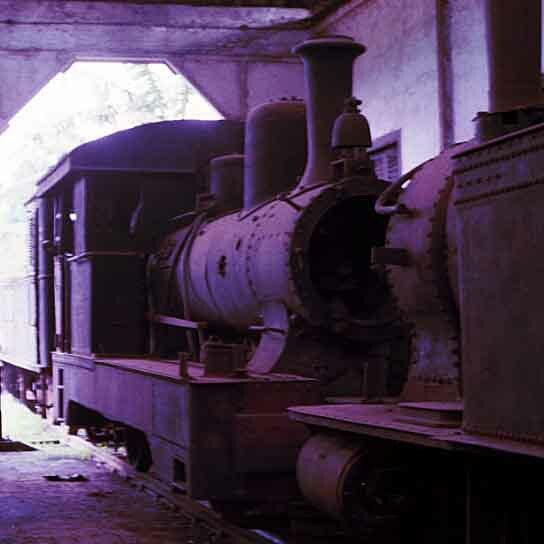 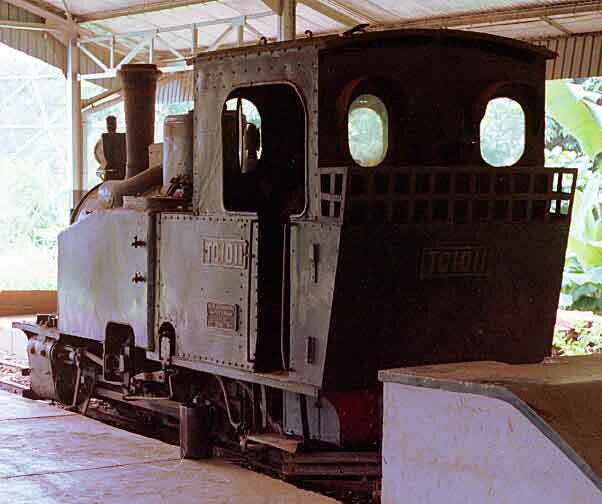 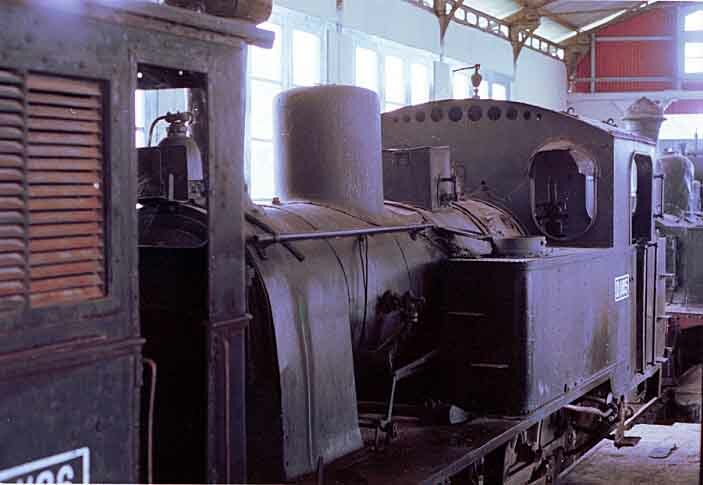 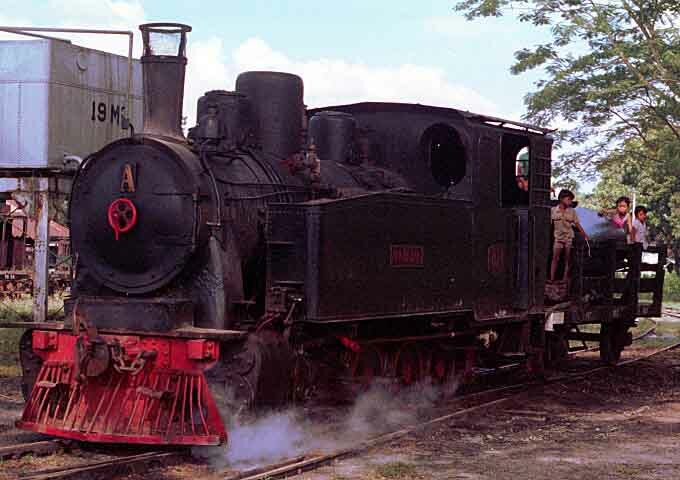 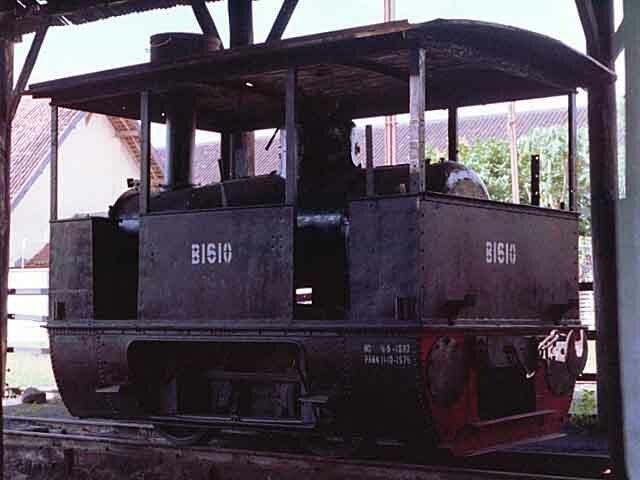 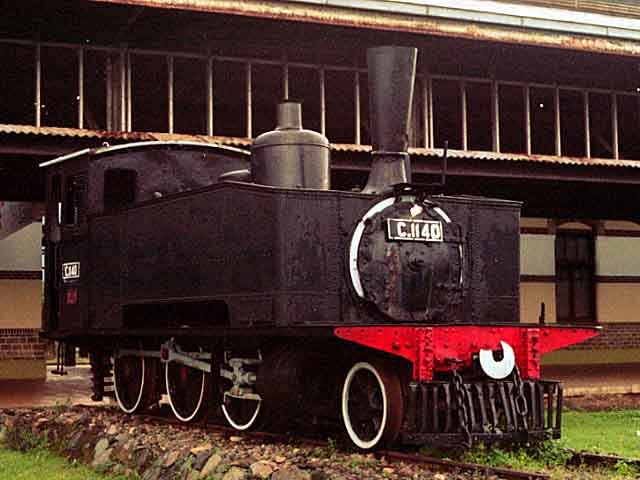 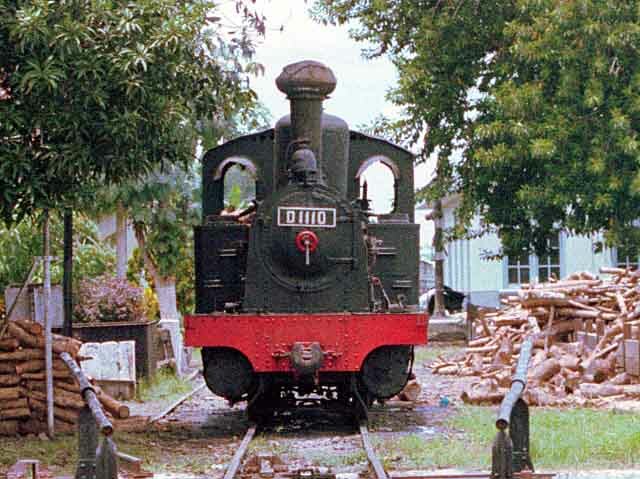 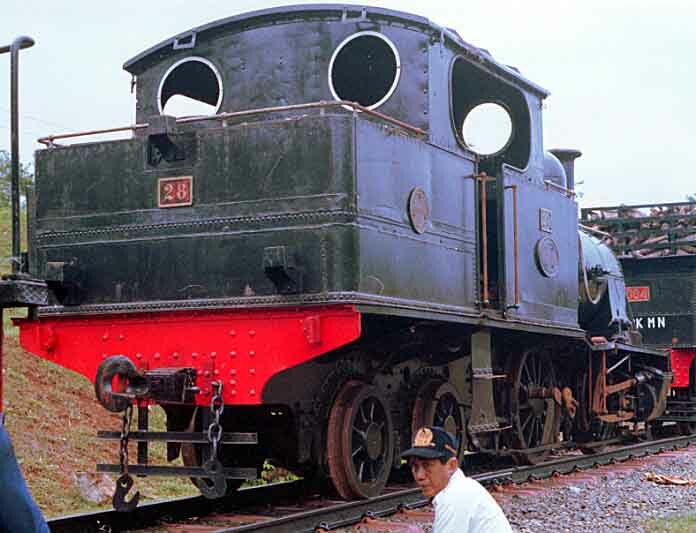 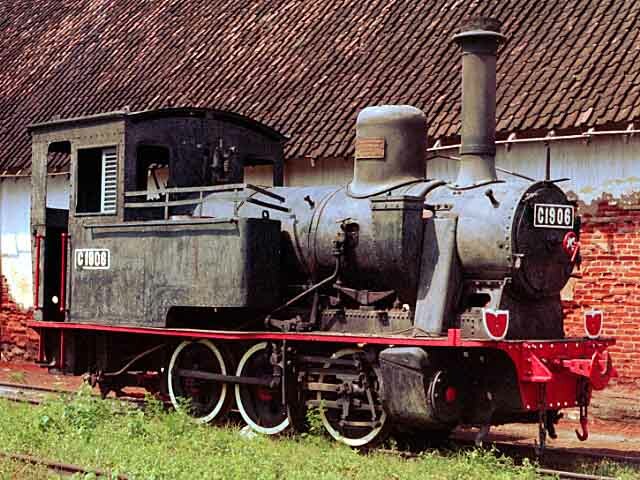 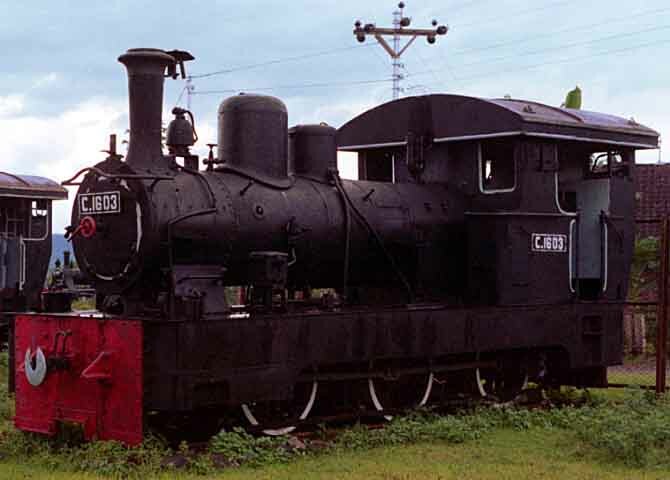 The next stop was Kertosono and this produced another surprise - C1101, Indonesia's oldest surviving steam locomotive, built in 1879, was in steam outside the roundhouse. 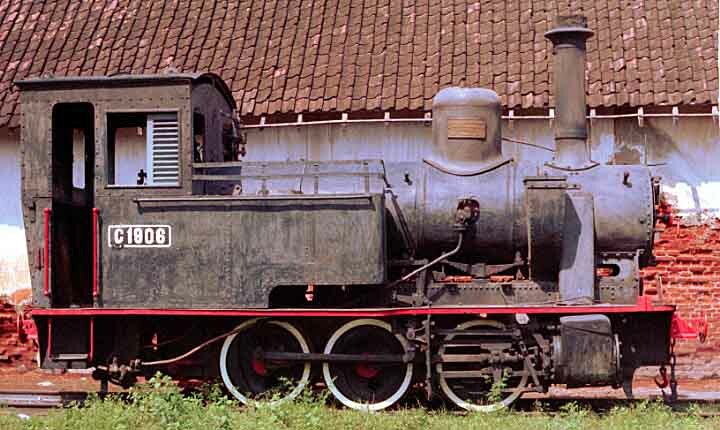 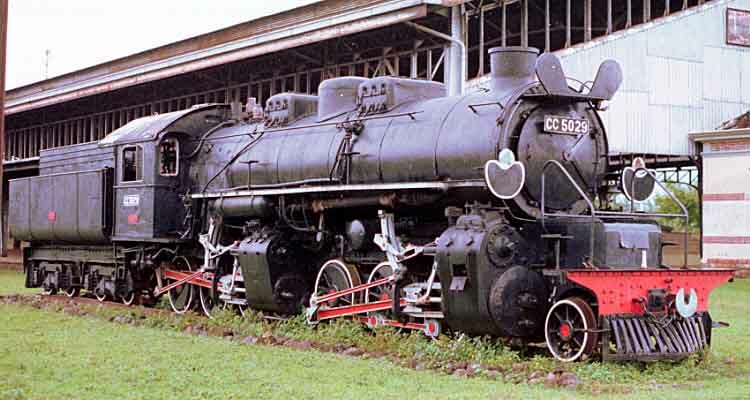 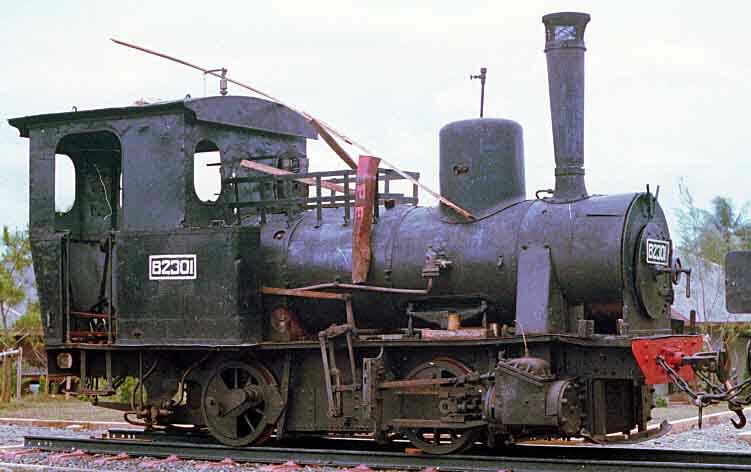 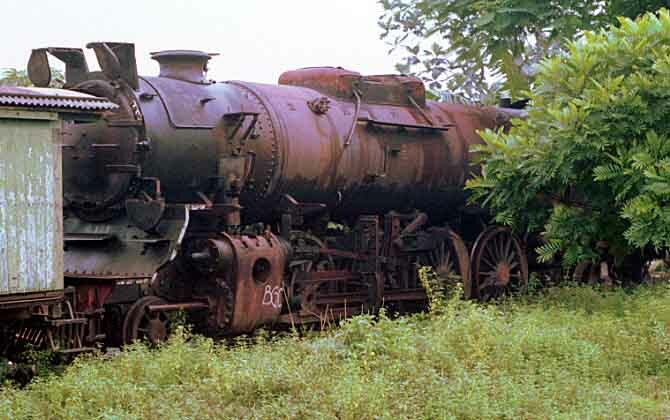 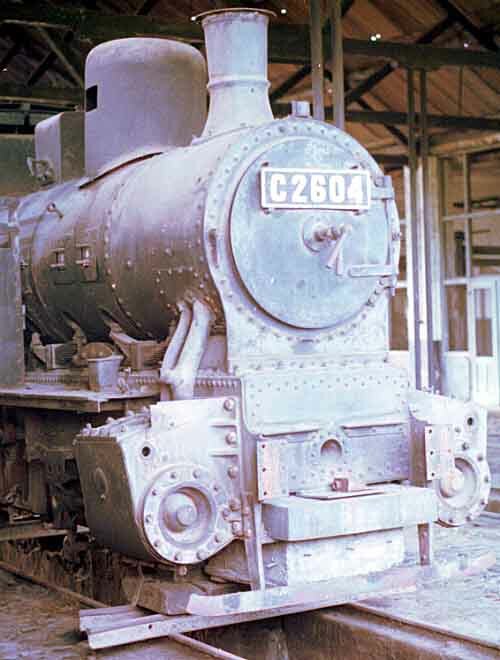 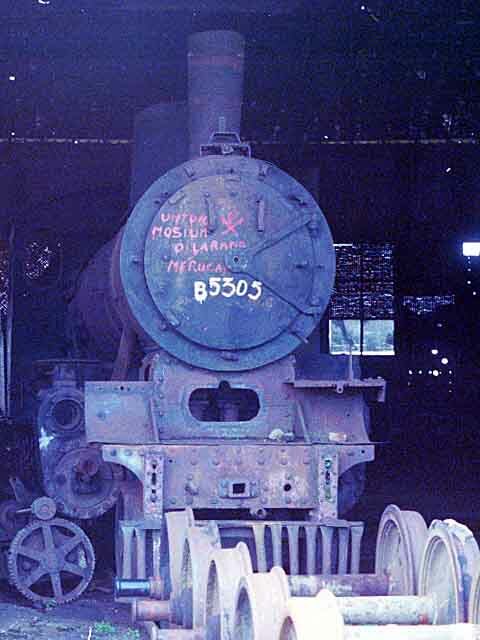 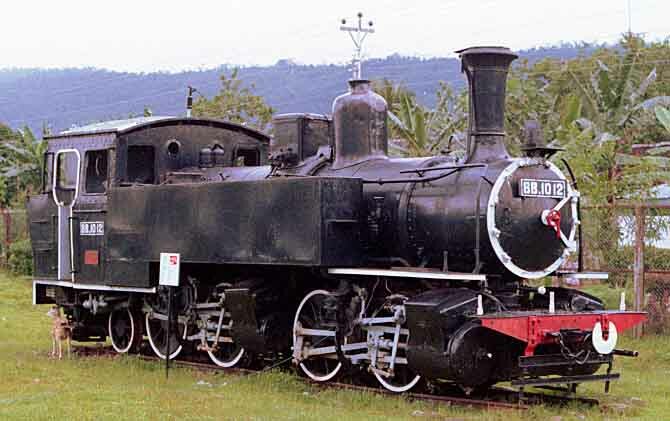 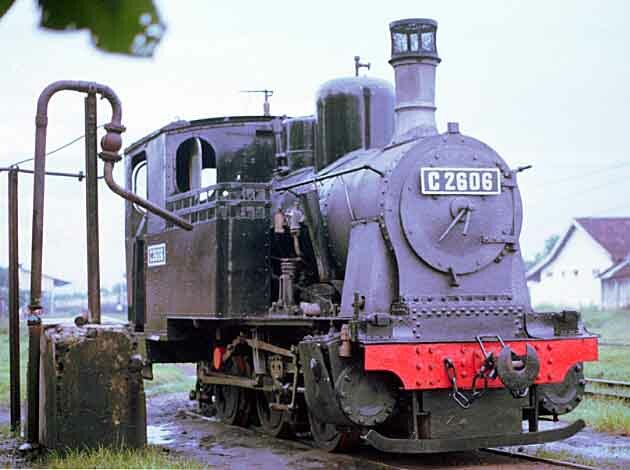 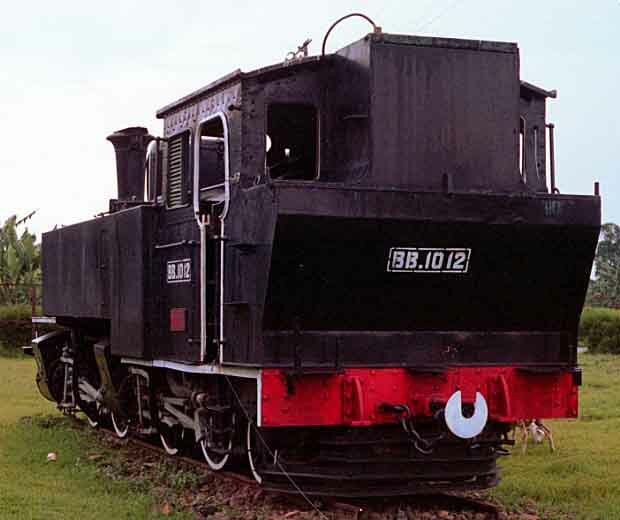 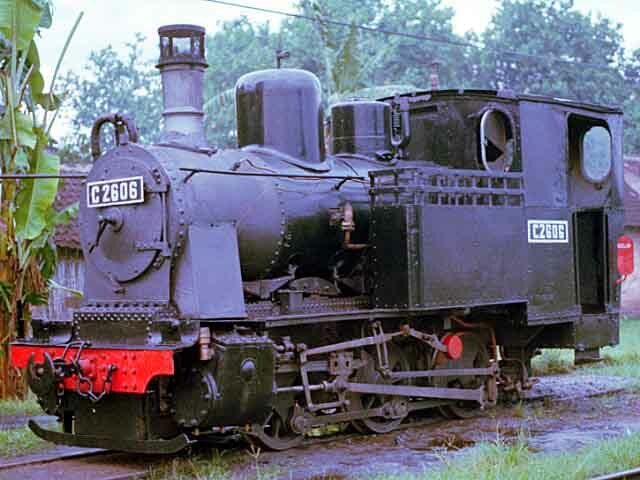 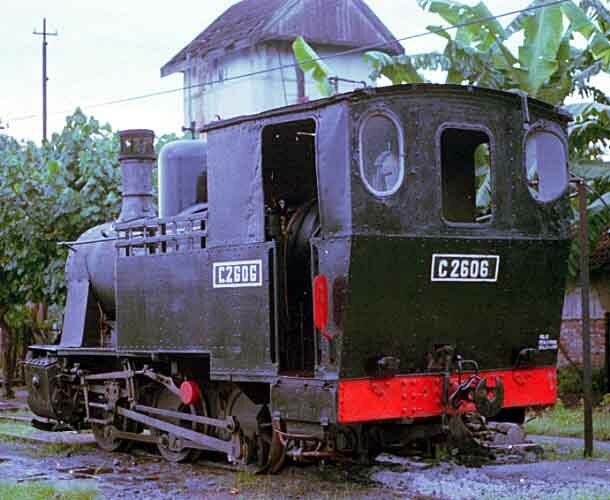 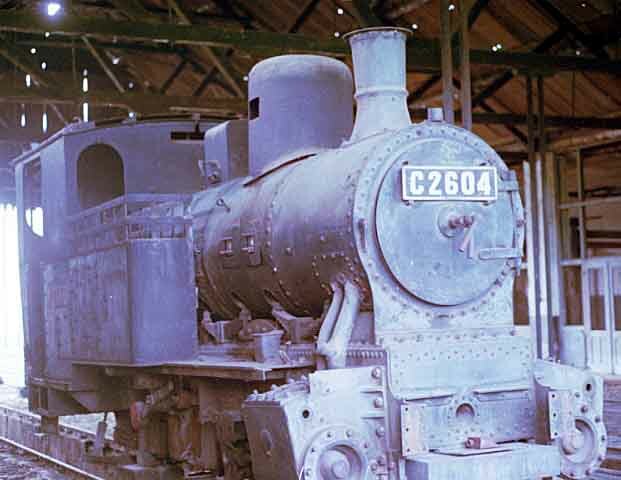 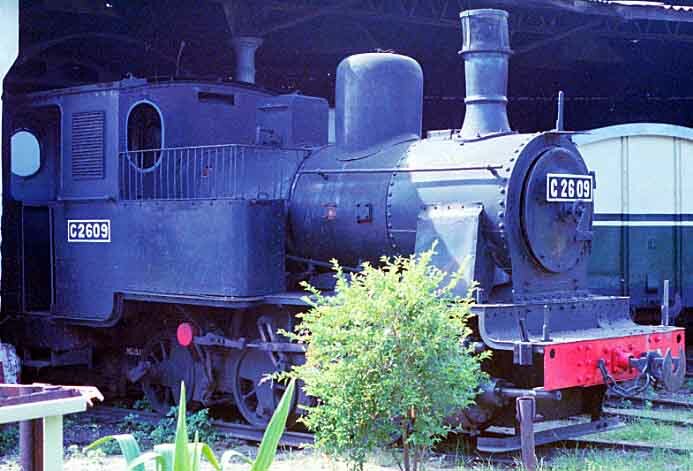 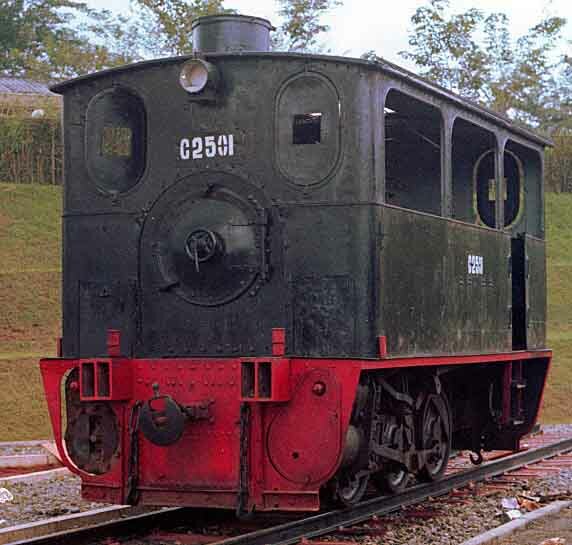 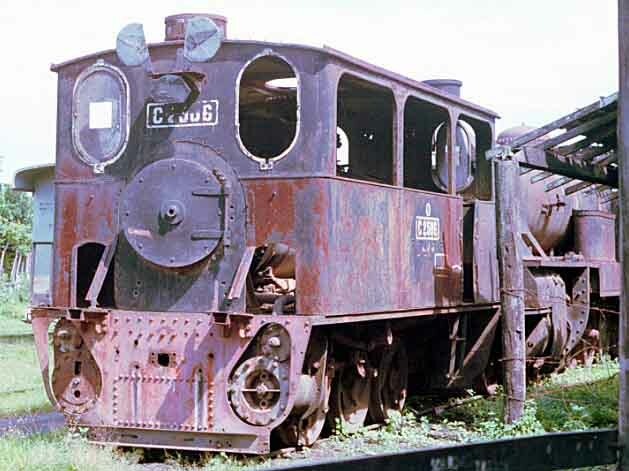 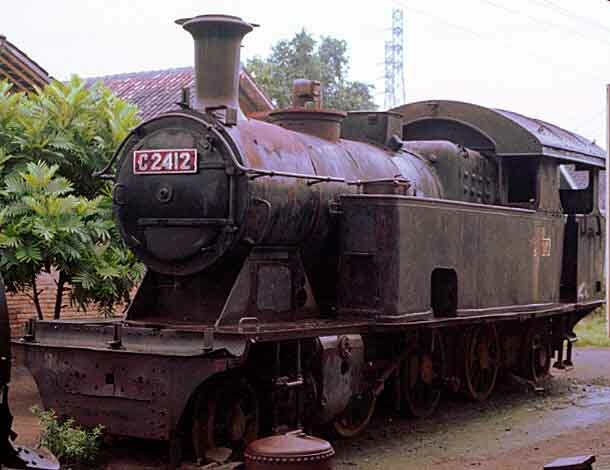 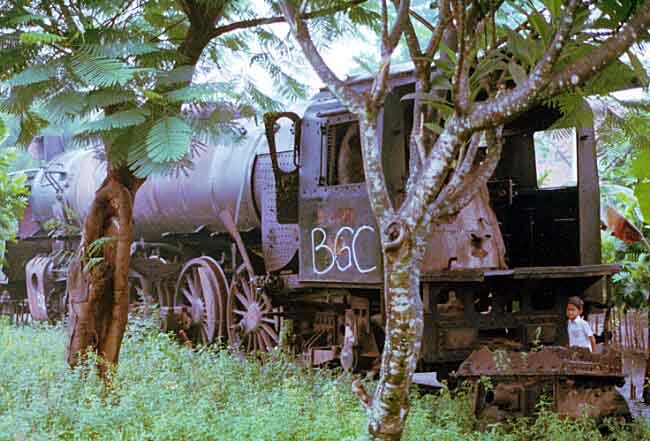 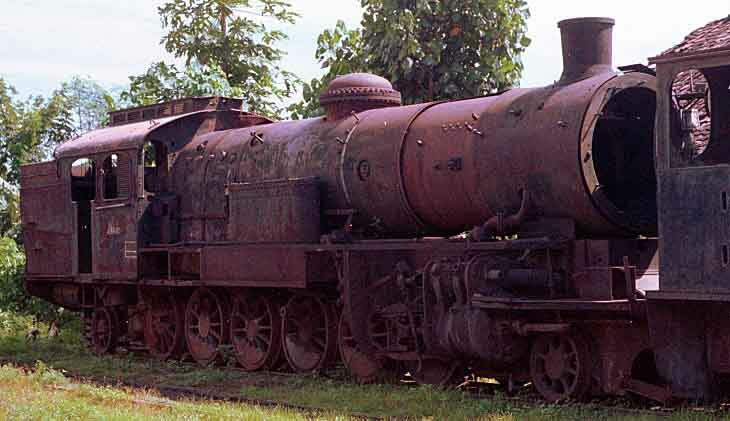 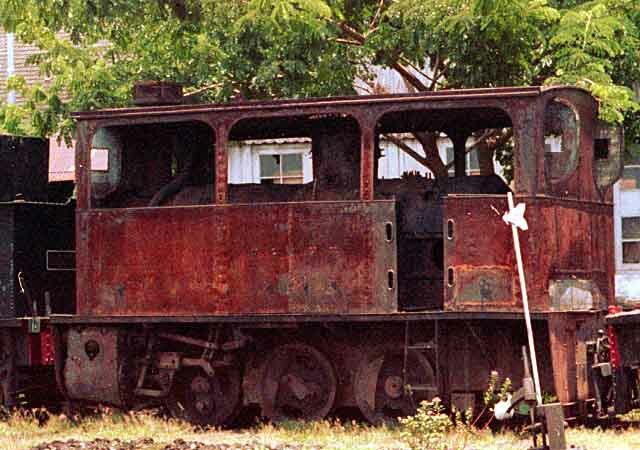 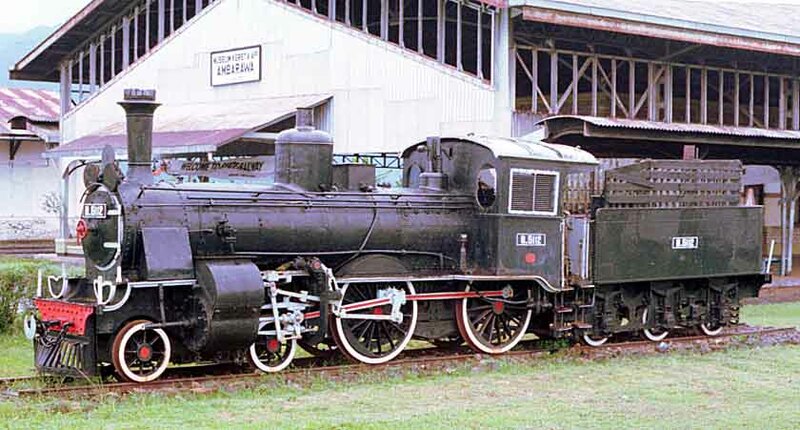 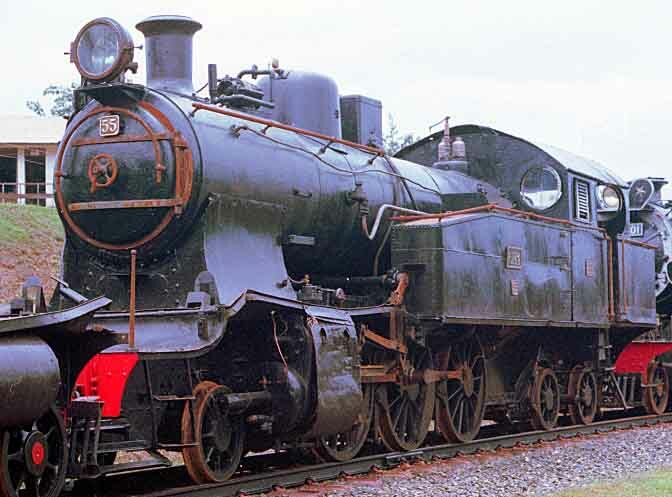 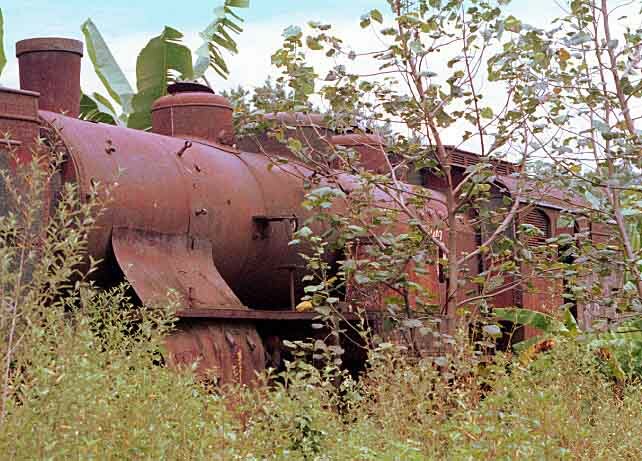 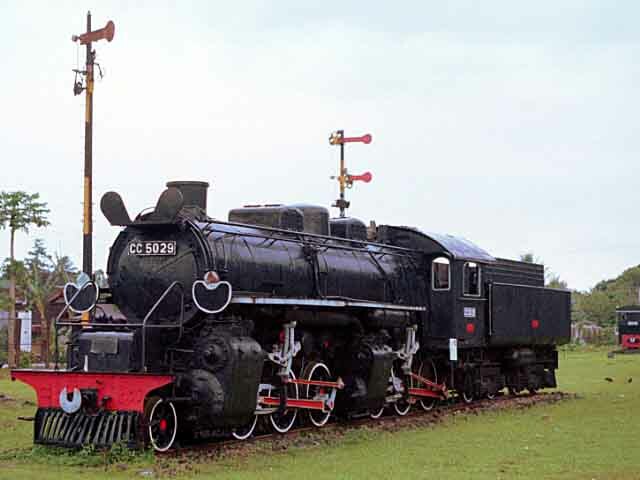 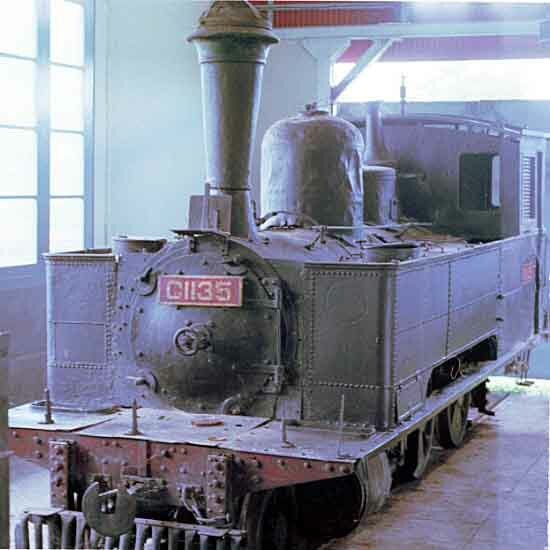 Also present was C2609, a source of spares for the Kediri loco I was told, a B53 marked for a museum and a D52. 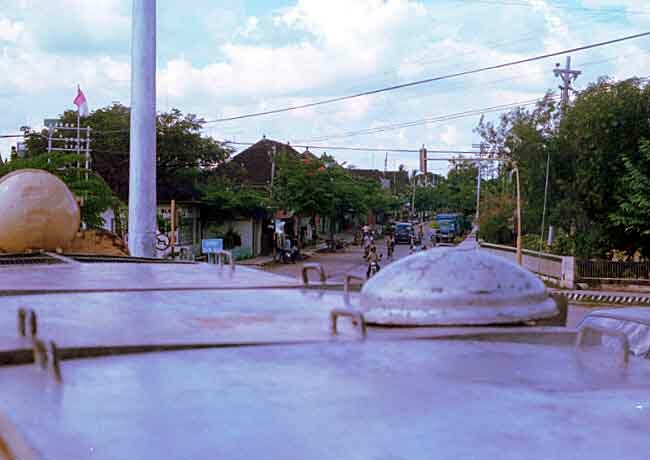 I then took a train to Madiun where I took more photos and details before catching a bus to Cepu. 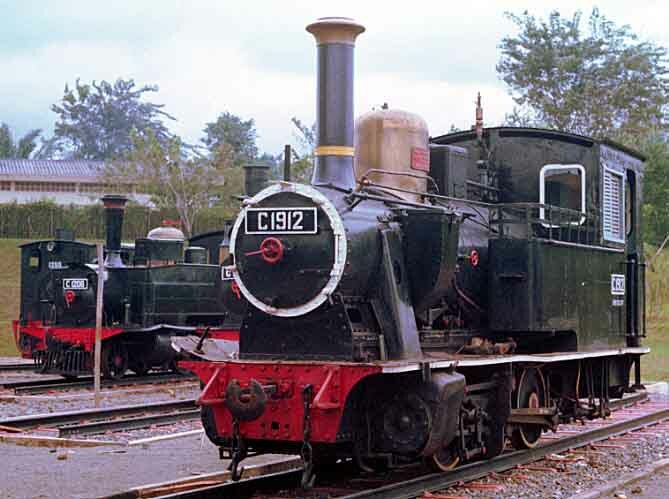 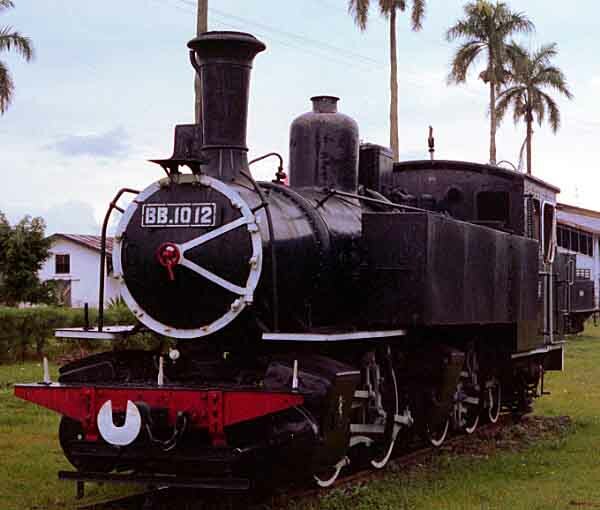 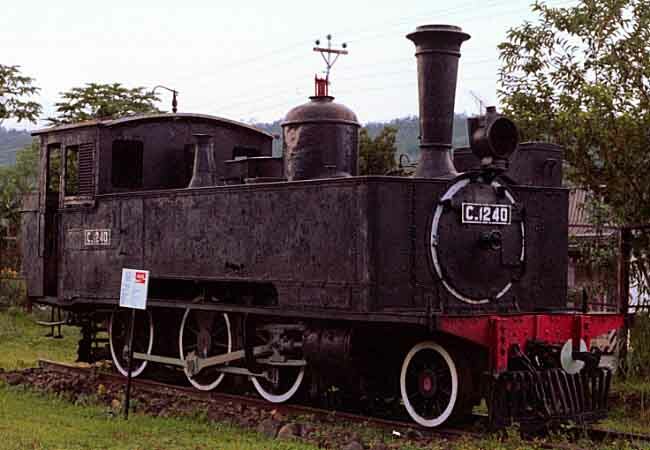 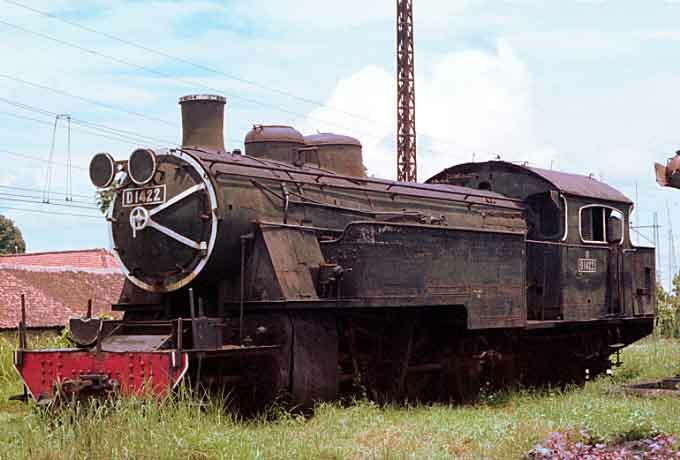 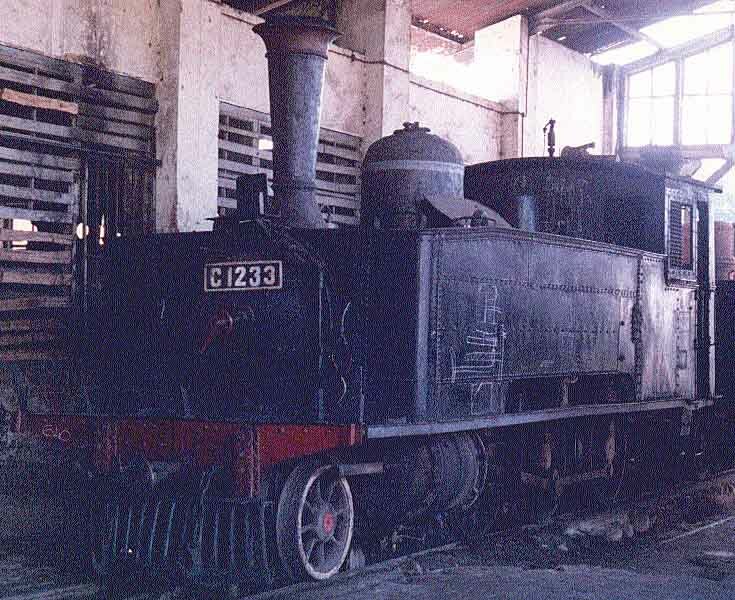 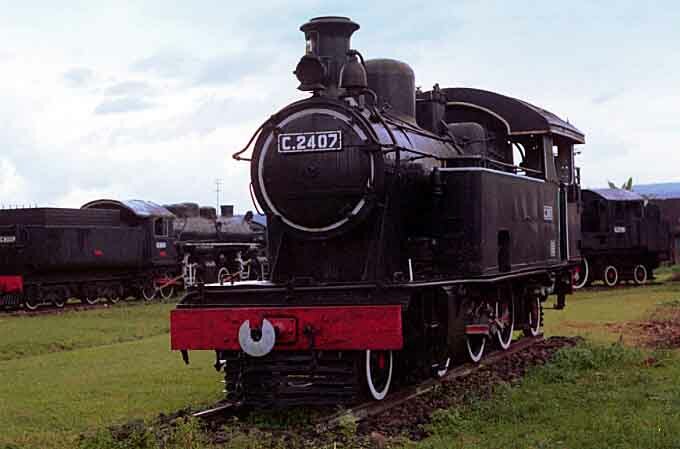 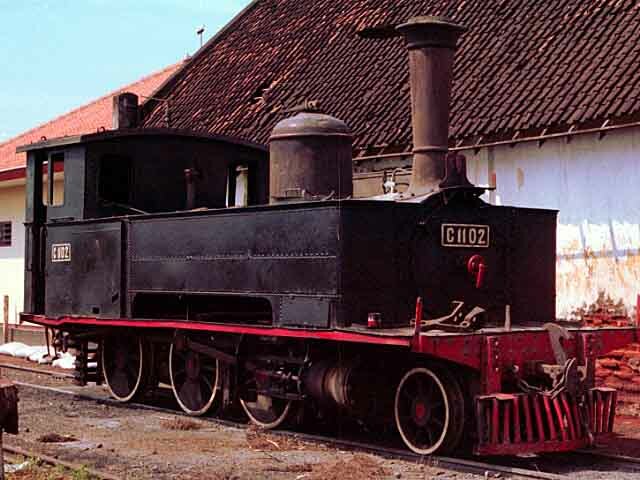 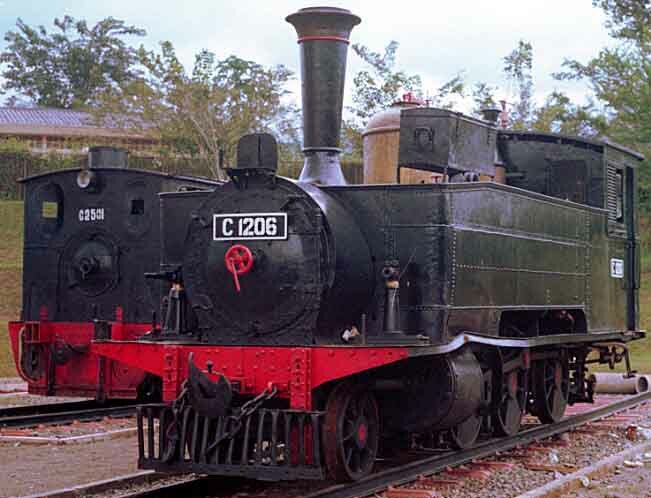 I had been told that Cepu depot contained more than 30 steam locomotives but on arrival I found that C1218 was the only one left. 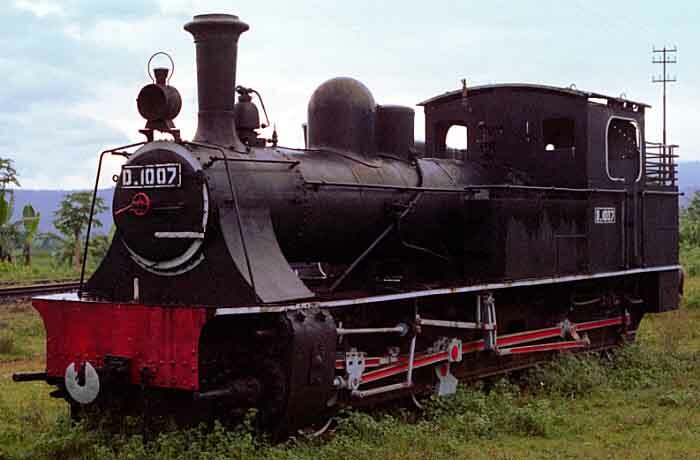 I asked about the forestry railway and was told to get on one of the diesels which was about to depart. 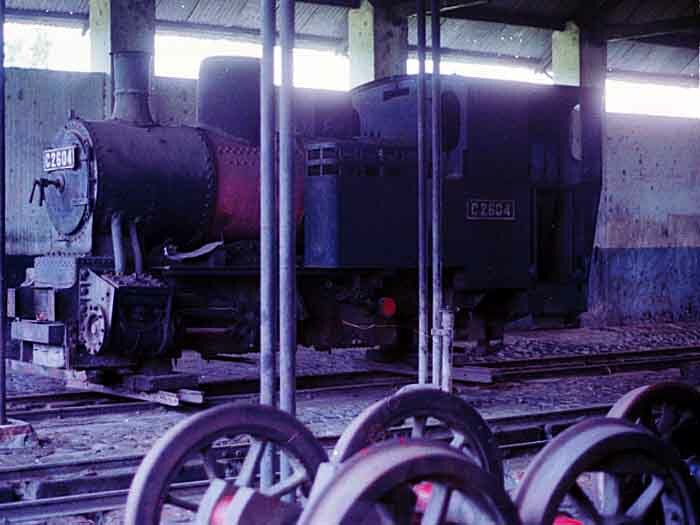 I was dropped off in the exchange sidings and walked to the depot where 0-6-0T A Augustus was in steam. 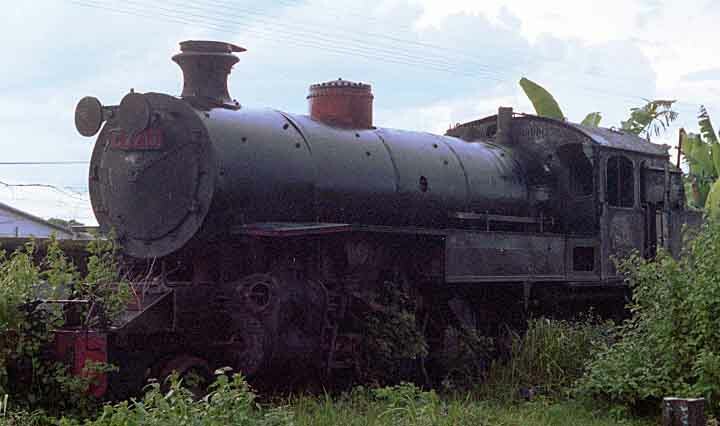 It departed while I was there and returned about an hour later. 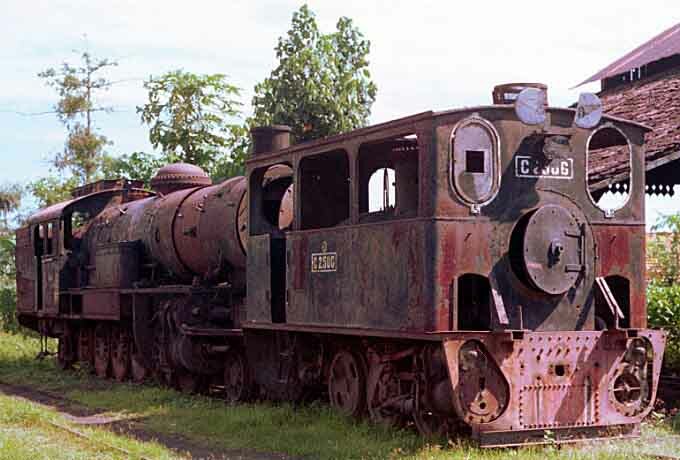 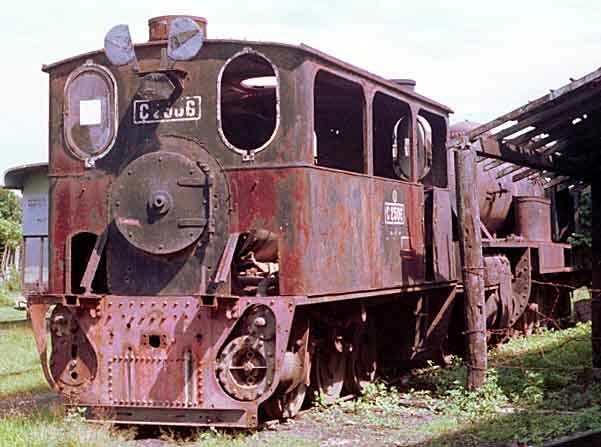 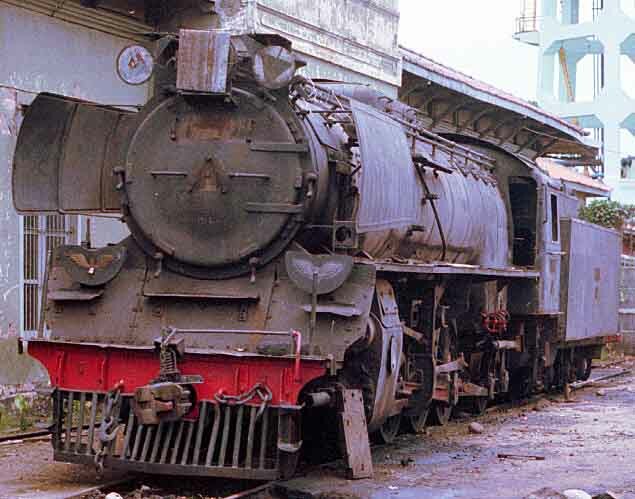 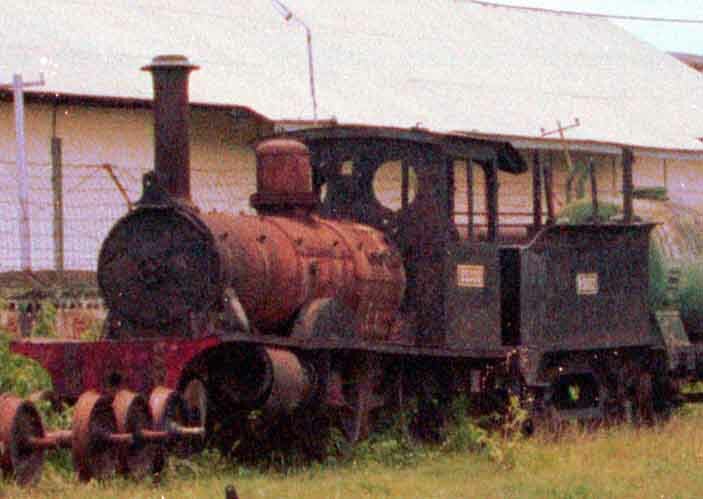 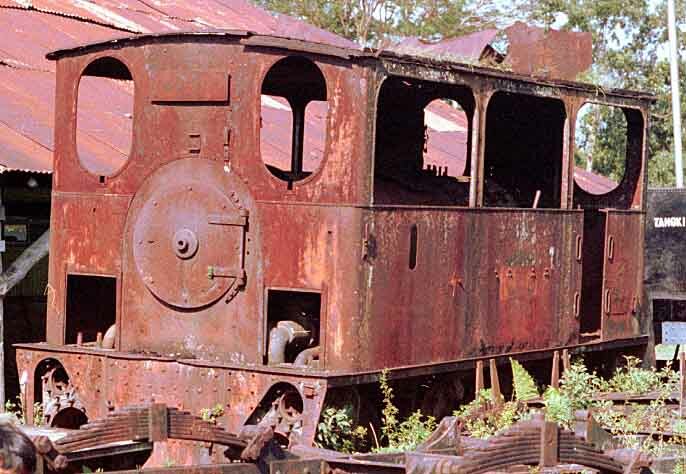 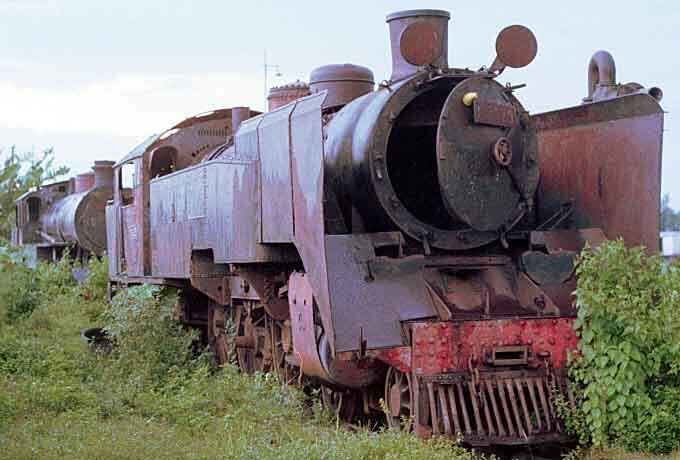 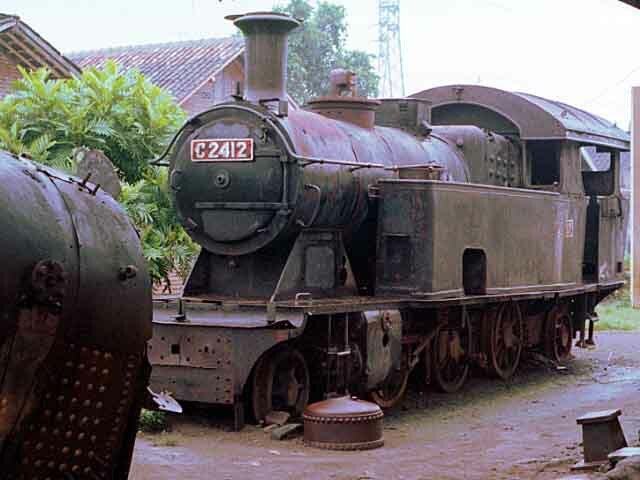 3 PJKA locos were there, C2902 was serviceable whilst C2502 and C2607 were both derelict. 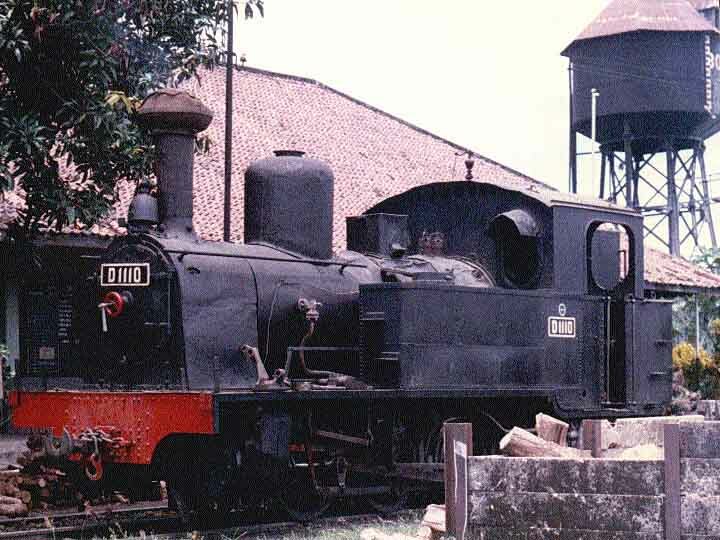 Also present were B Bahagia, 388 and 390. 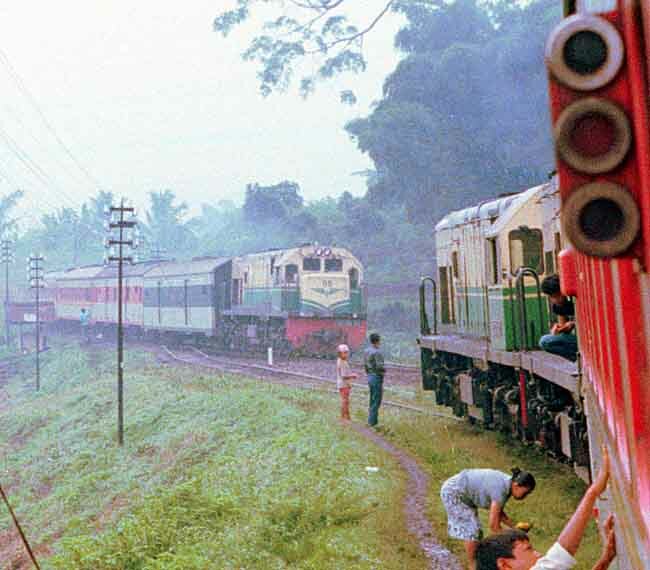 I took a train to Semerang, where I stayed the night, and then another train to Jakarta. 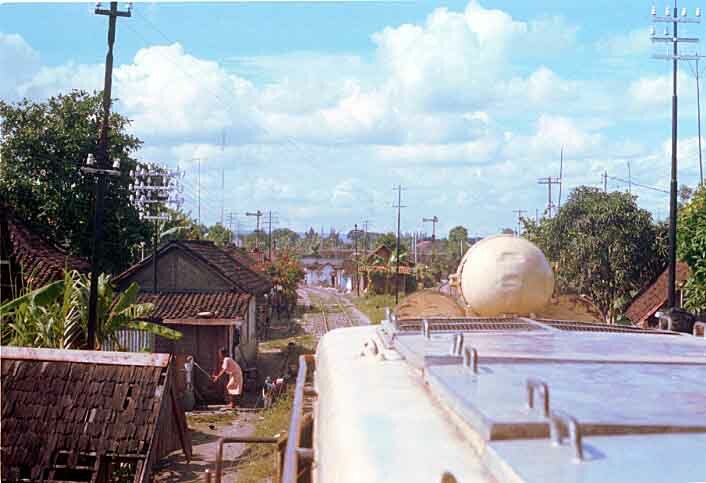 I took just one photograph, at Cirebon (right, above). 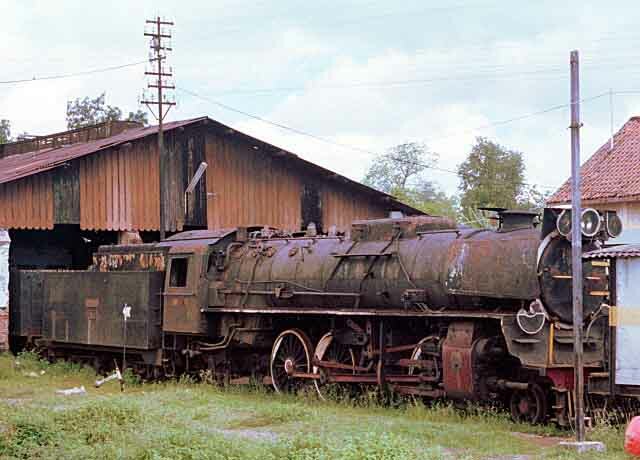 At Jatibarang I saw B1304 and C2856 inside the shed as we passed. 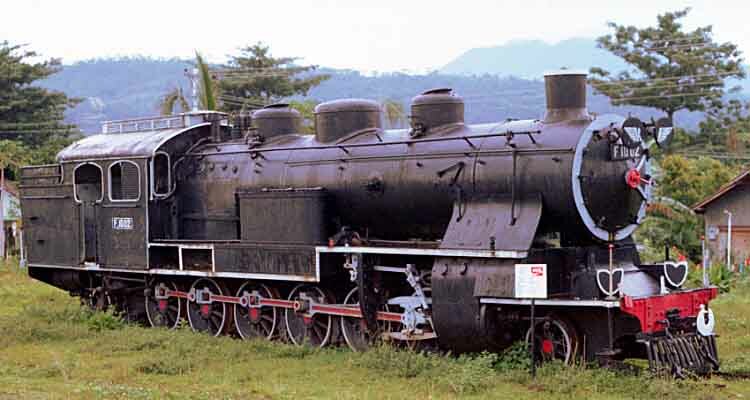 The next morning (24th) I went to Kota but there was no steam there, I was told they had been moved to Mangarrai. 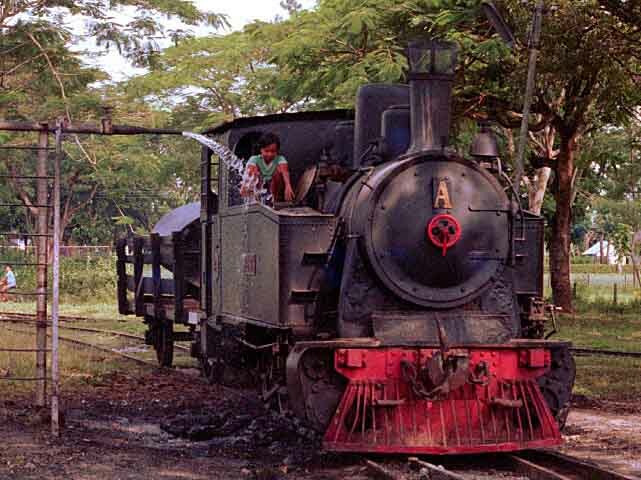 I then took a train to Mangarrai. 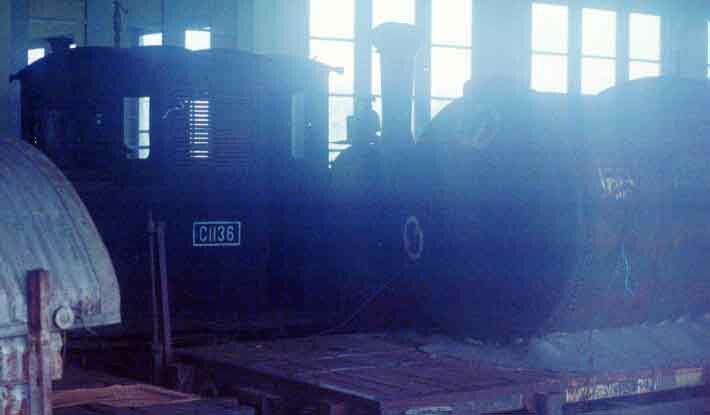 I was not allowed inside the works but I could see TC1015 inside. 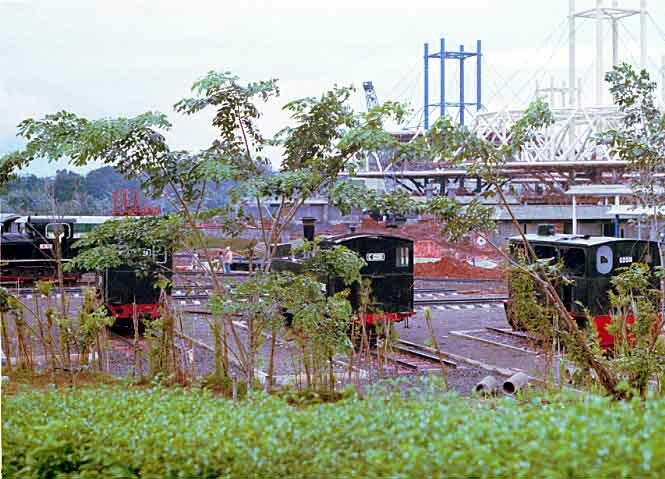 I asked about the others and was told they had been moved to Taman Mini, some only that morning. 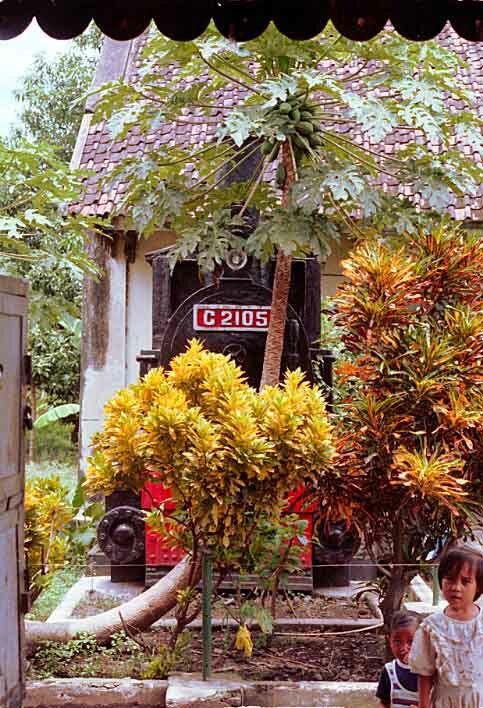 All the photographs on the left were taken at the Taman Mini "Indonesia in miniature" park. 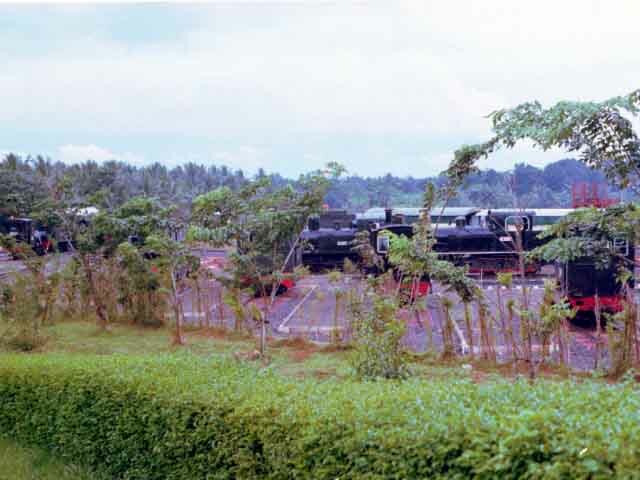 The Railway museum was being set up in an adjacent field and was not open to the public at that time which made it easy to photograph during a lunch break. 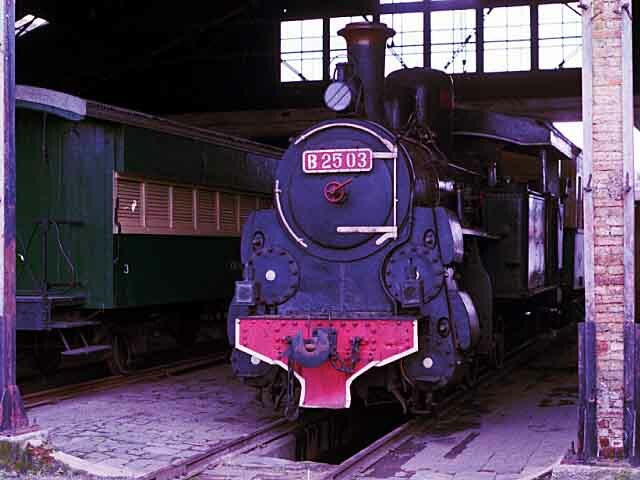 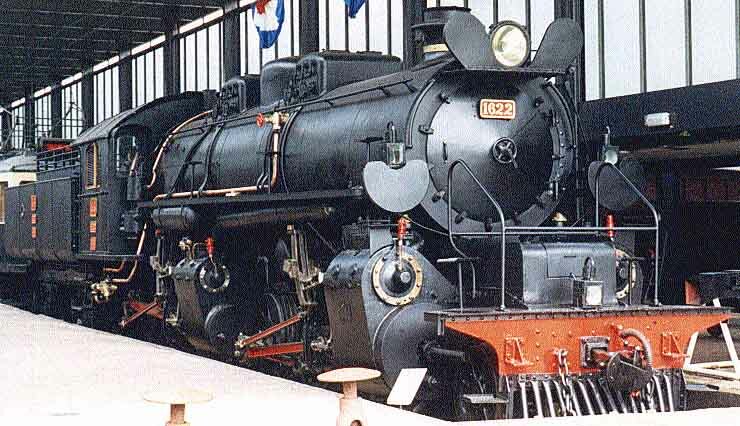 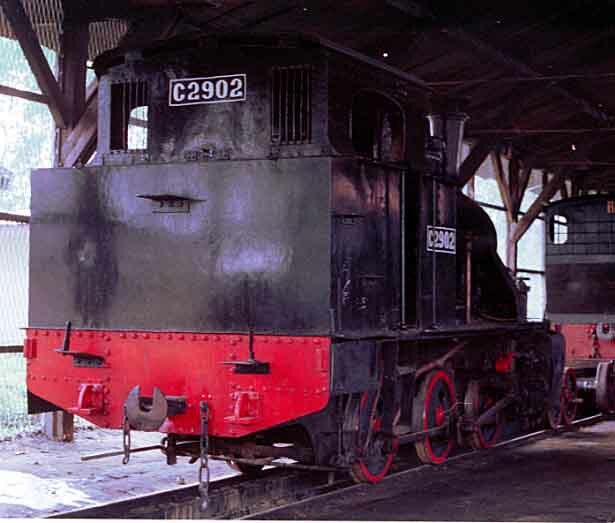 1622 (CC5022) in Utrecht museum, 1992.